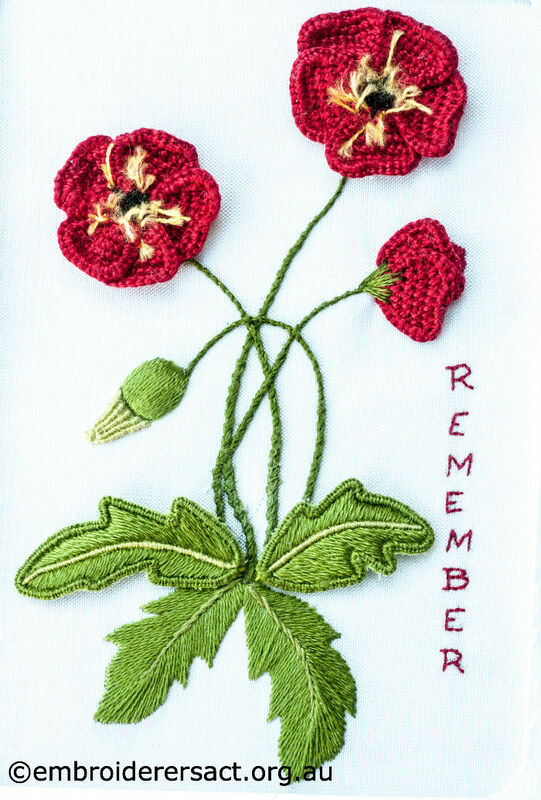 I hope you’re having a great weekend. 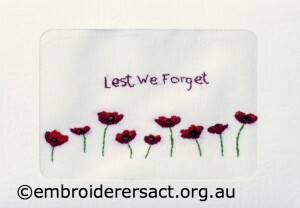 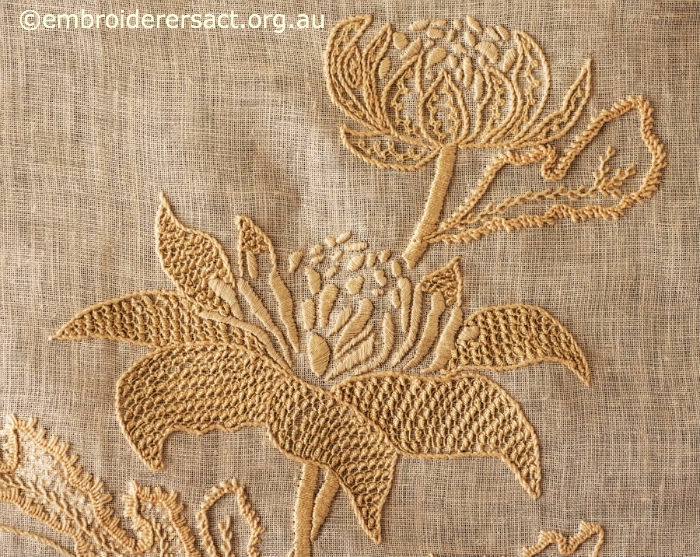 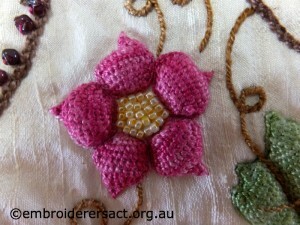 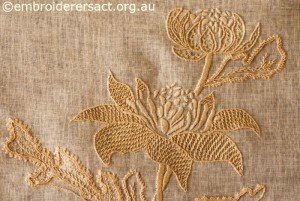 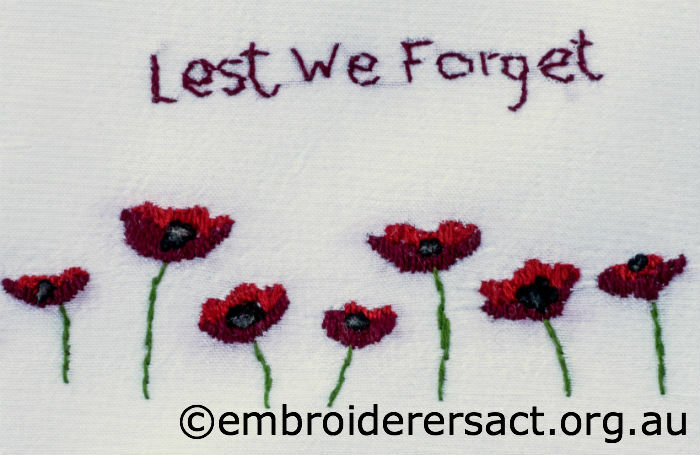 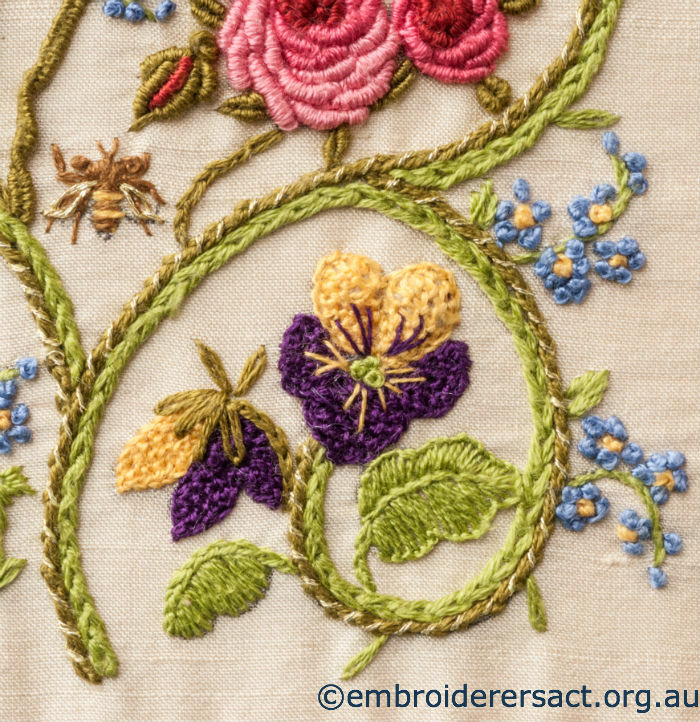 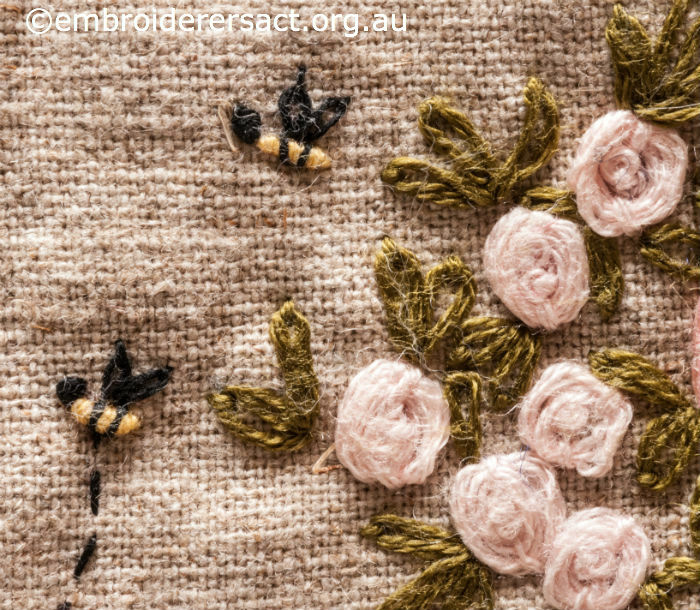 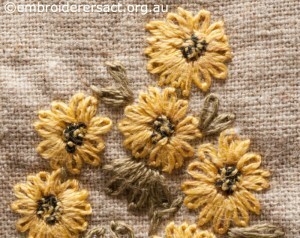 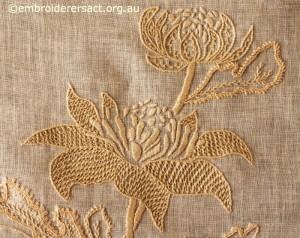 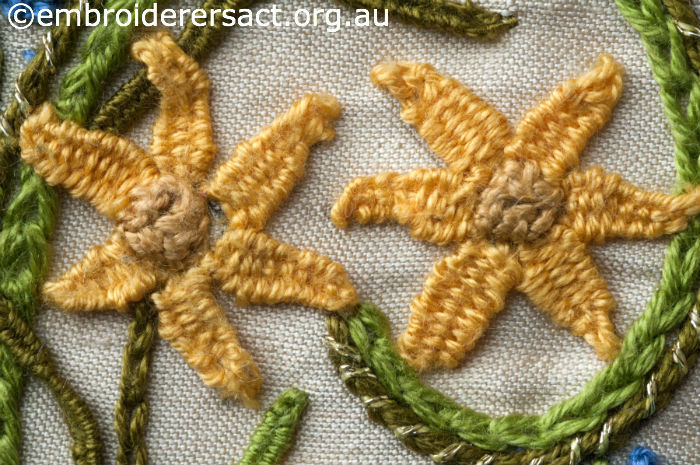 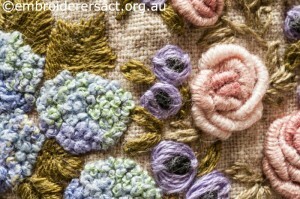 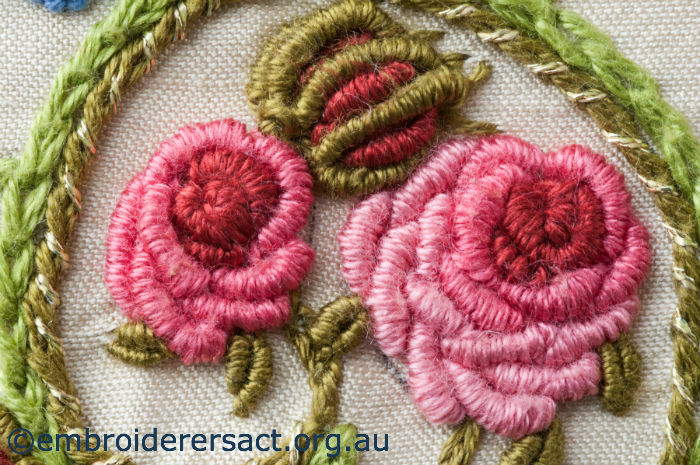 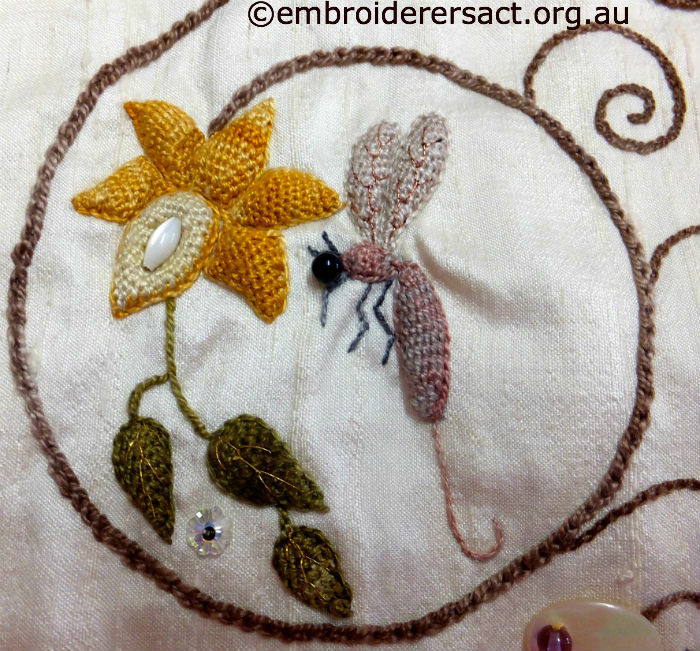 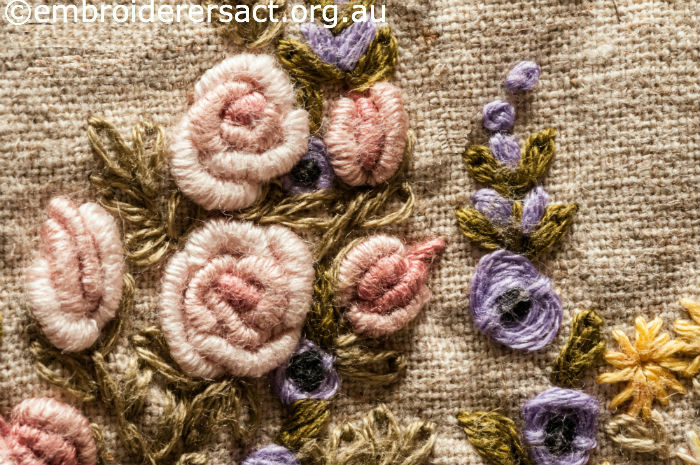 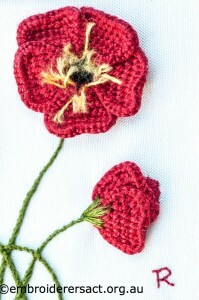 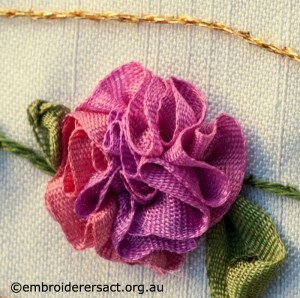 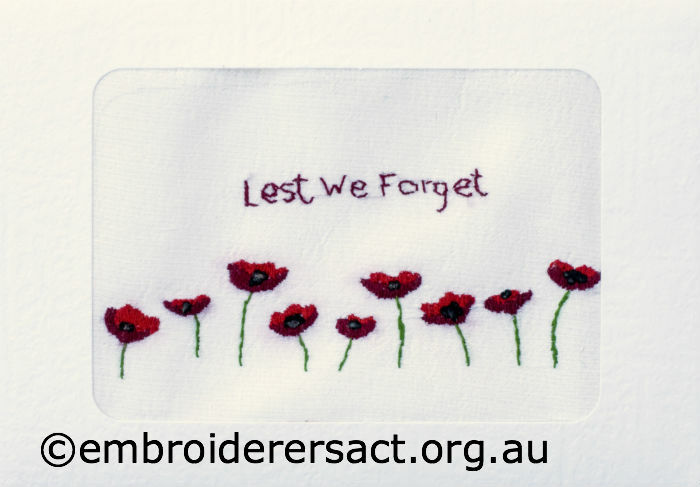 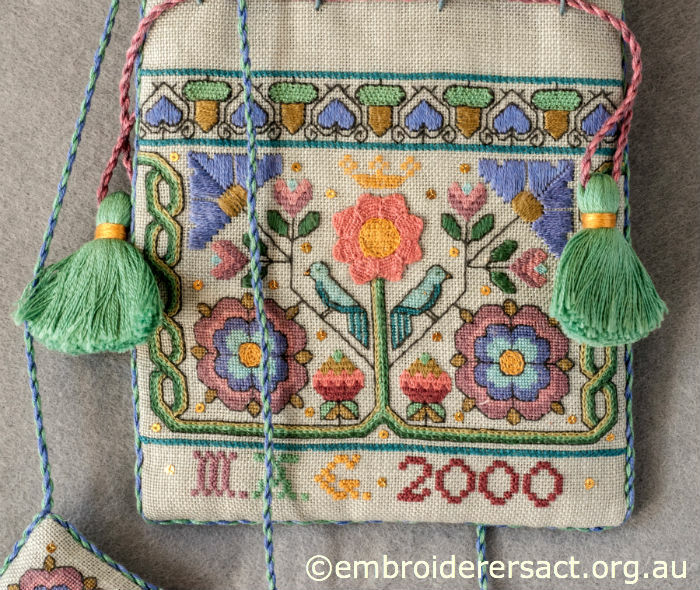 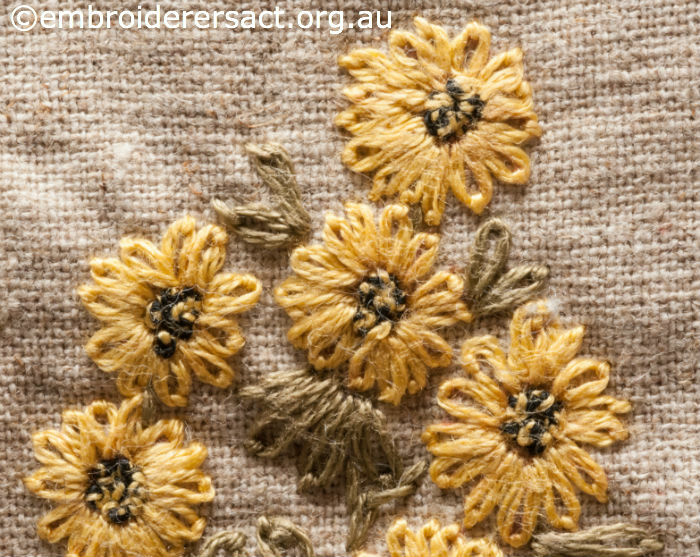 Here are two lovely flower embroideries just in case you’re needing some stitchy eye candy. 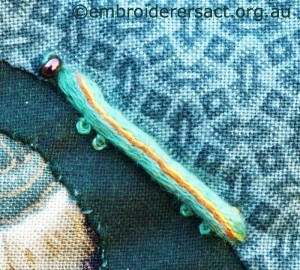 Thanks to Stewart Bath for the awesome photos of the stitching. 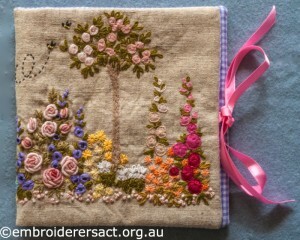 The first is another diary cover by Marjorie Gilby filled with an elegant and traditional flower garden…. 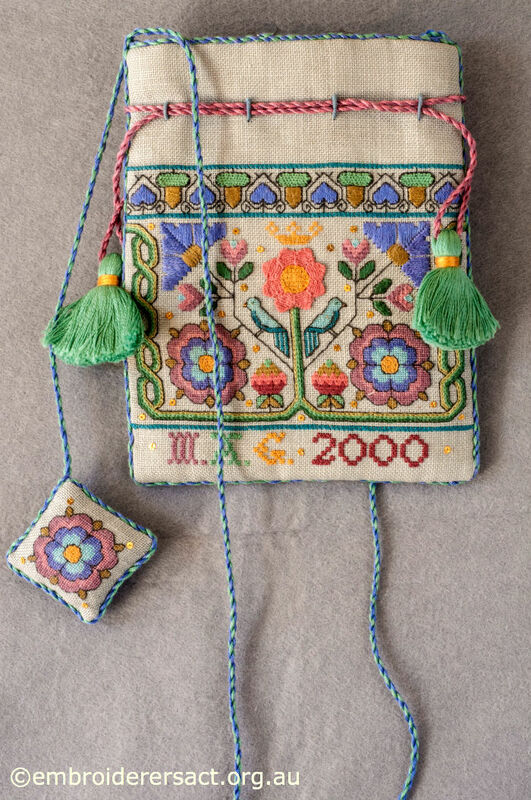 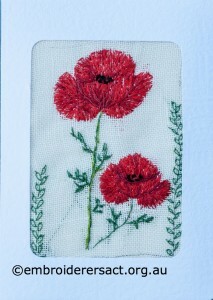 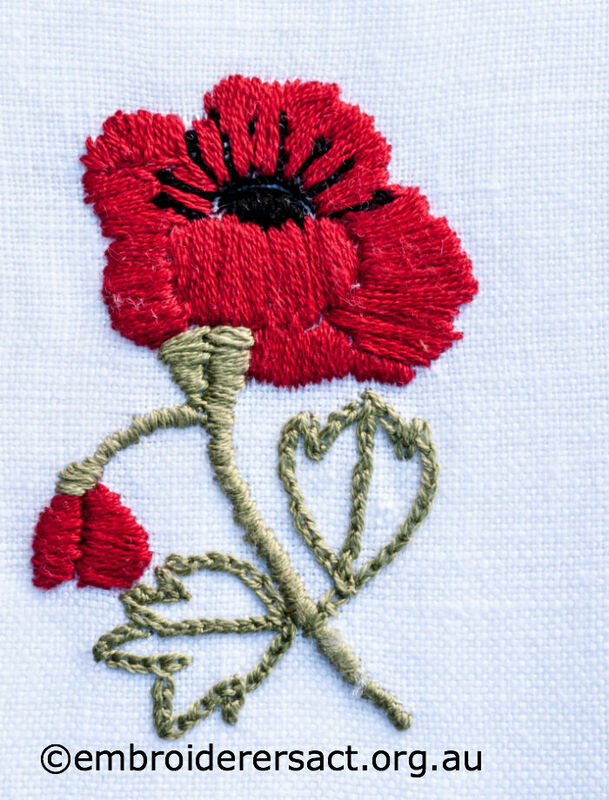 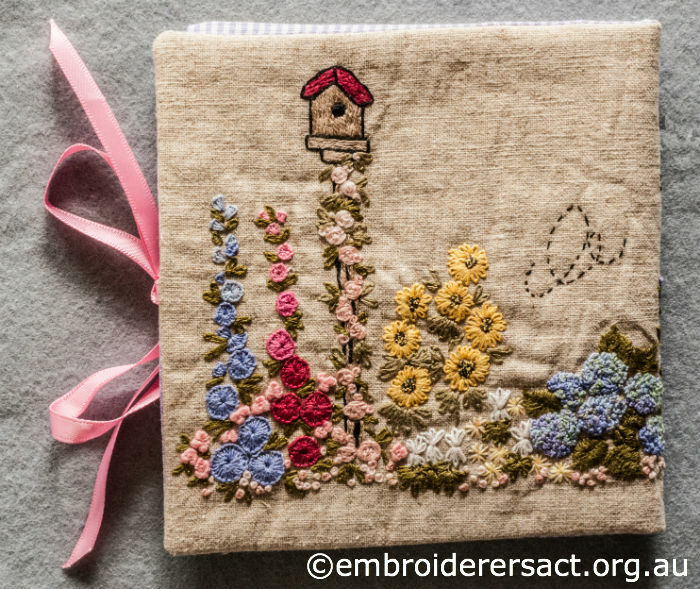 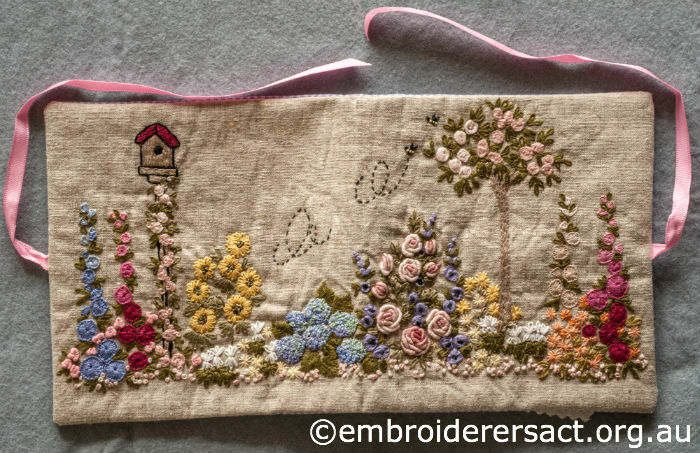 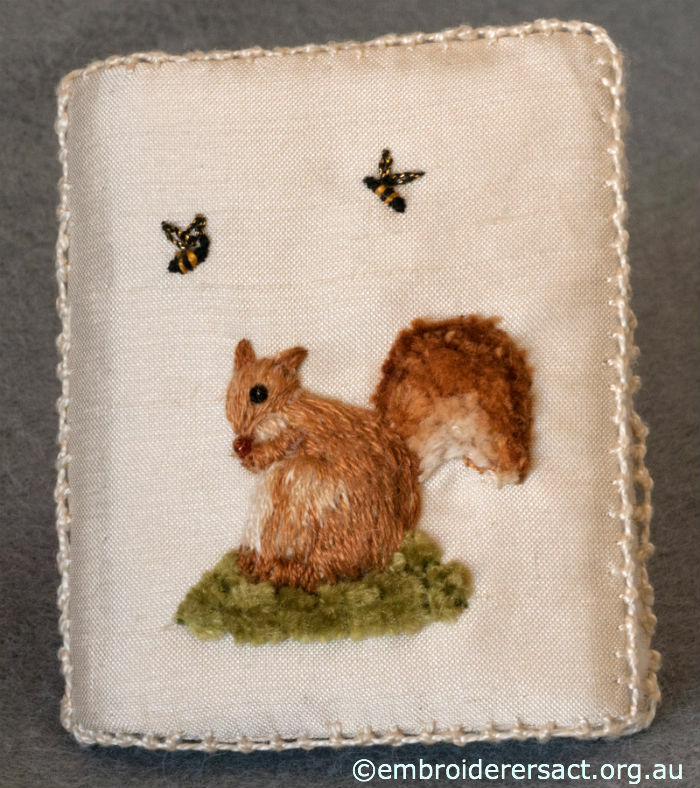 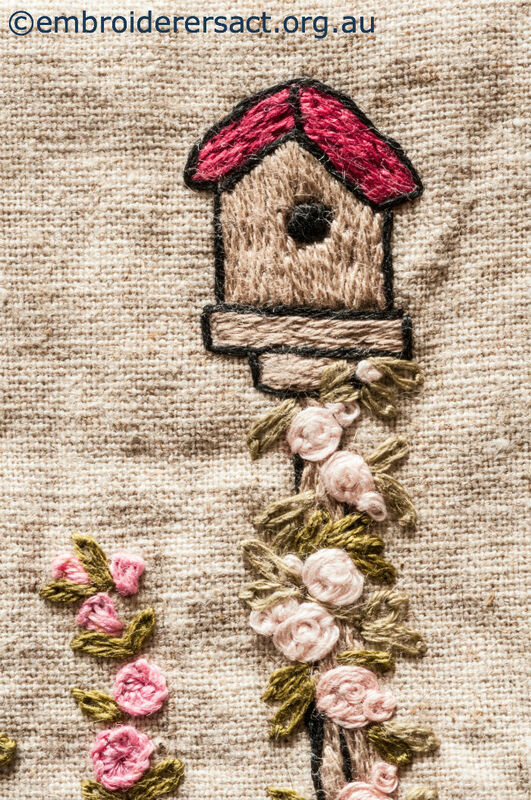 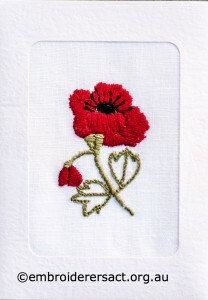 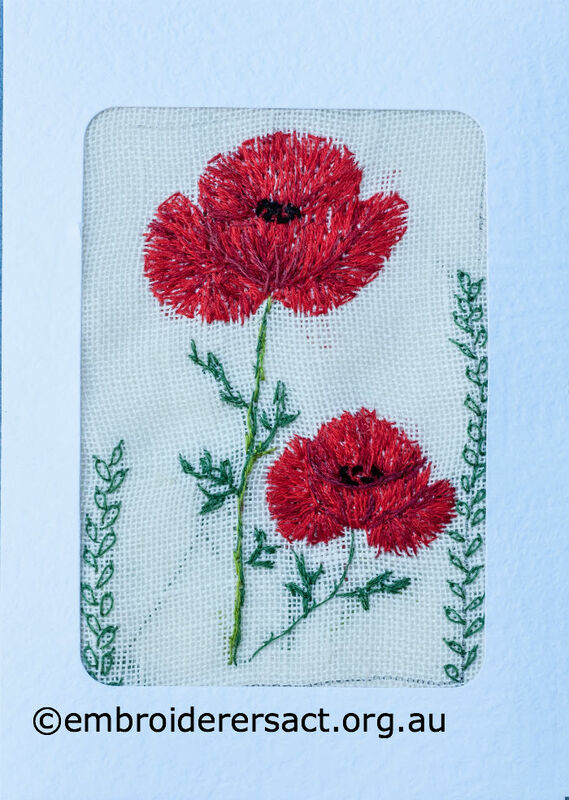 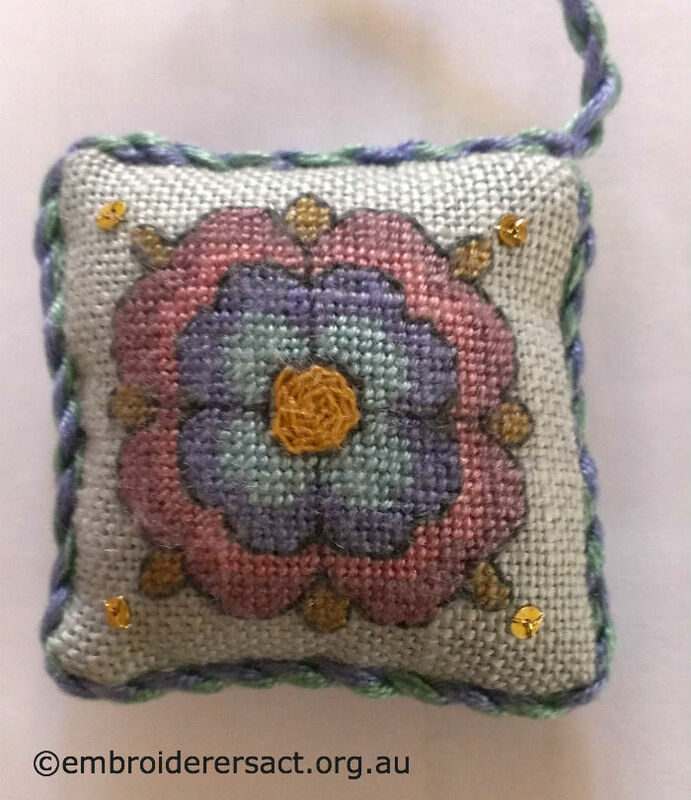 The second is a lovely flower garden needle case stitched by Yvonne Kingsley…..
Hope you get to enjoy your garden this weekend. 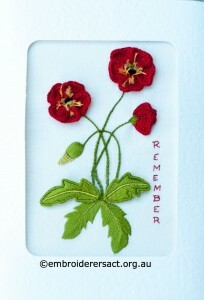 Spring is starting to arrive here and the camellias, hellebores and jonquils are out in our garden – Yay!!!! This is a tapestry in the tradition of the Bayeux Tapestry – an epic account of Scottish history, wonderful design by artist Andrew Crummy and just awesome stitching. 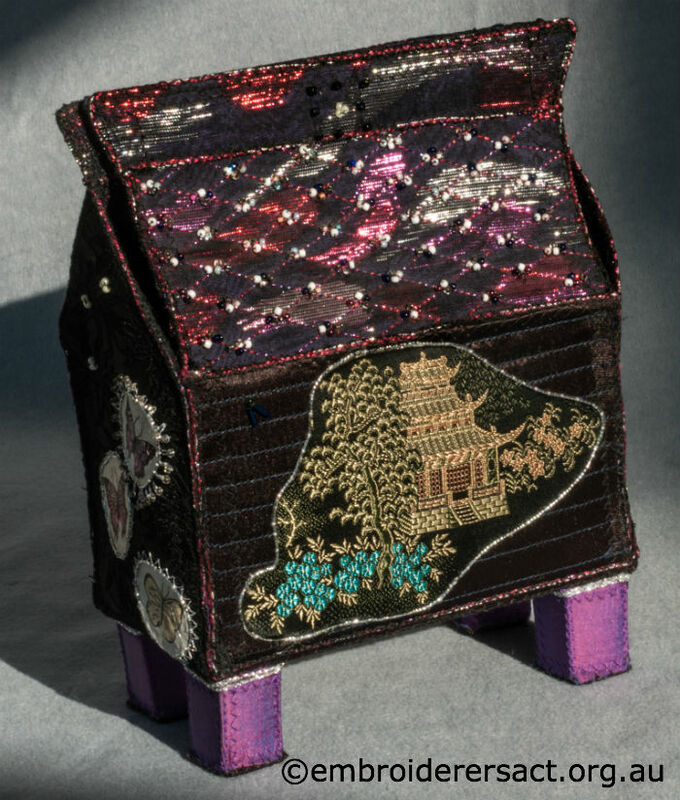 Meredith’s work is technically and aesthetically breathtaking – she combines embroidery, resin and other materials to create multi-layered and sculptural textile works. 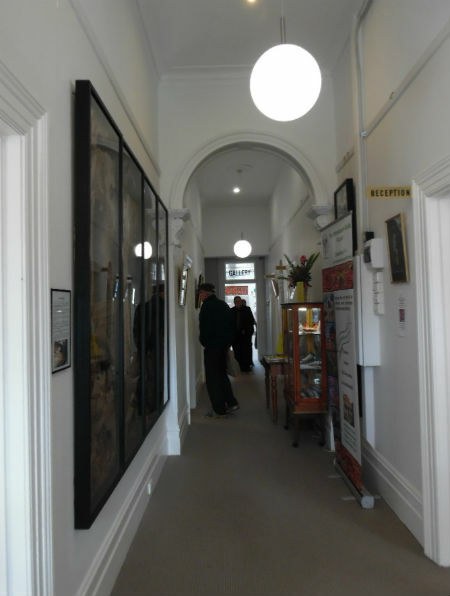 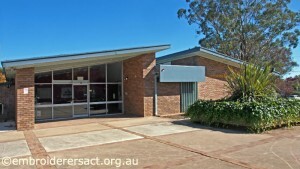 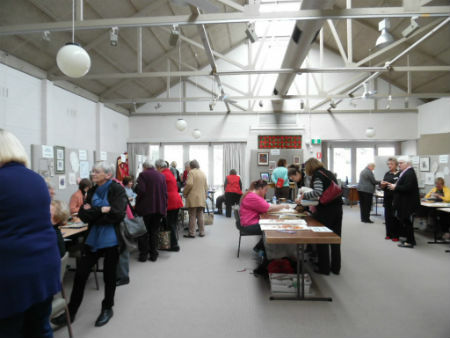 She’s having an exhibition from 5-31 July in the Pop Up Gallery at the Milk Factory, 33 Station St (rear), Bowral. 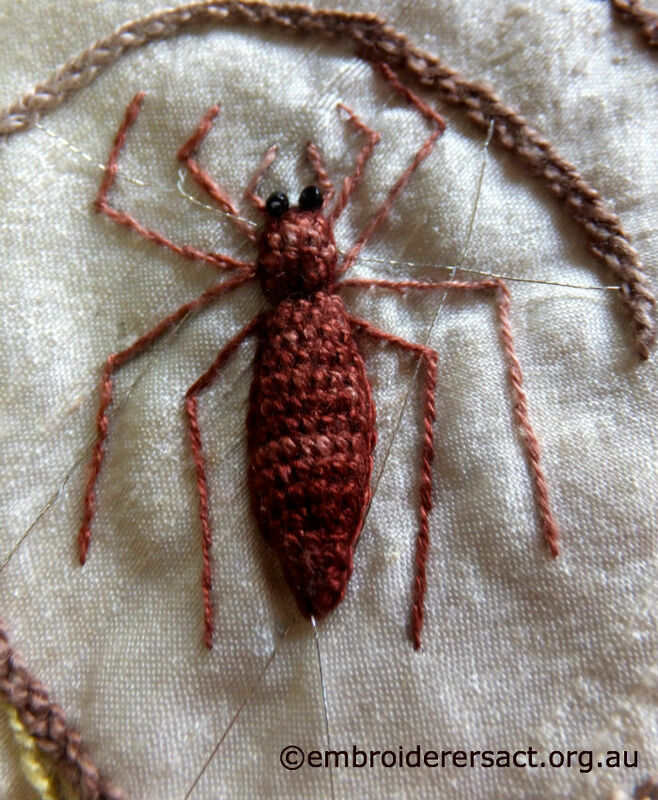 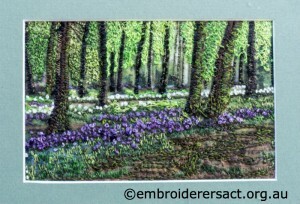 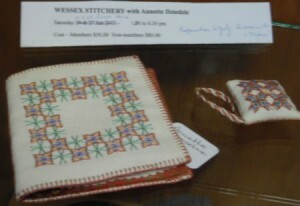 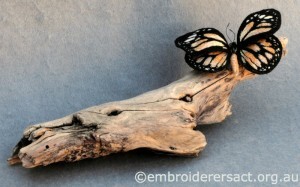 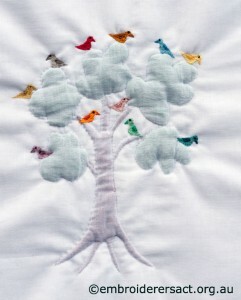 I’m sharing another example of Marjorie Gilbey’s wonderful stitching. 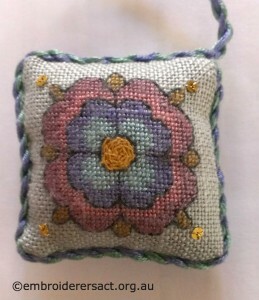 This Elizabethan Sweet Bag is just exquisite. 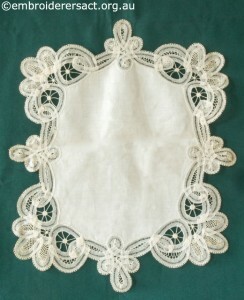 It’s quite small – 12.5 x 16 cm or 5 x 6.5 inches. 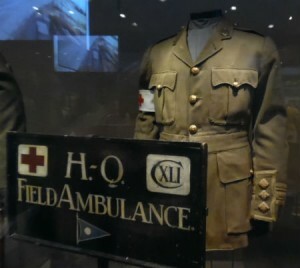 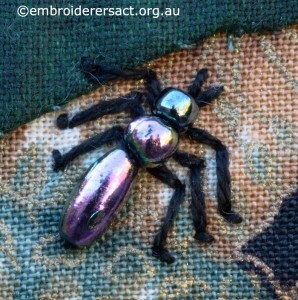 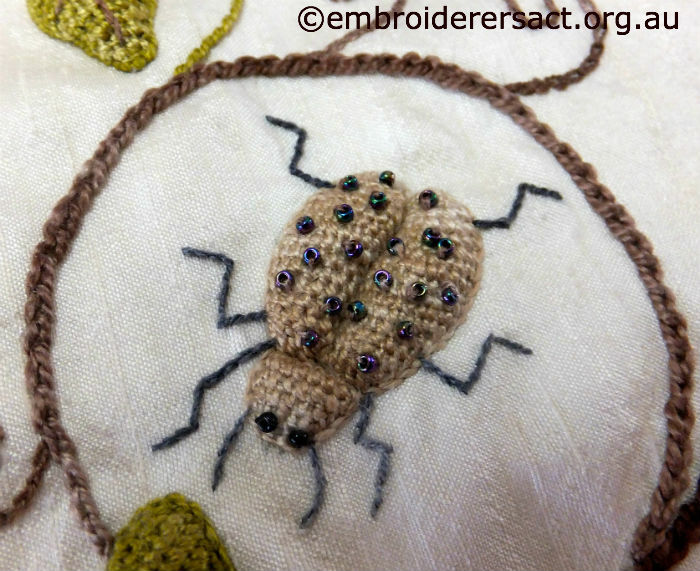 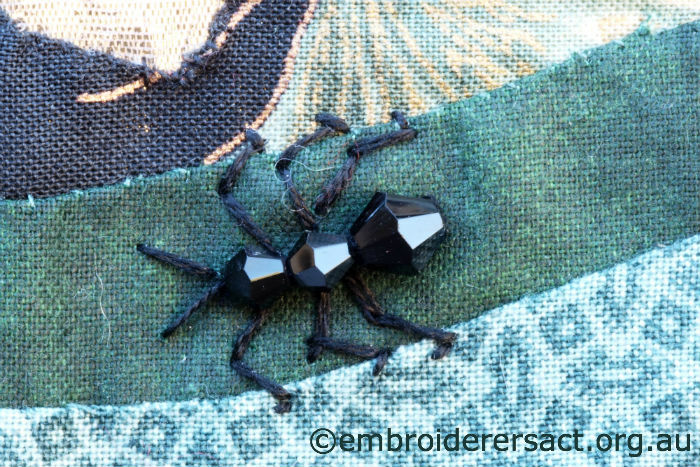 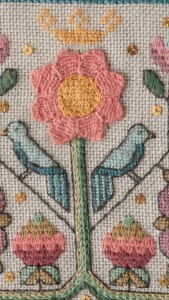 The technique is counted work and best described as petit point. 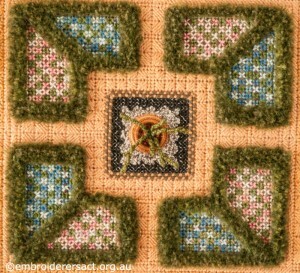 In this closer view you can see that the horizontal green borders are done in Long-armed Cross Stitch. 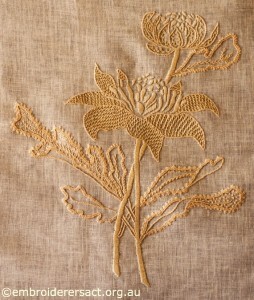 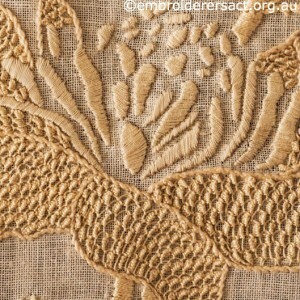 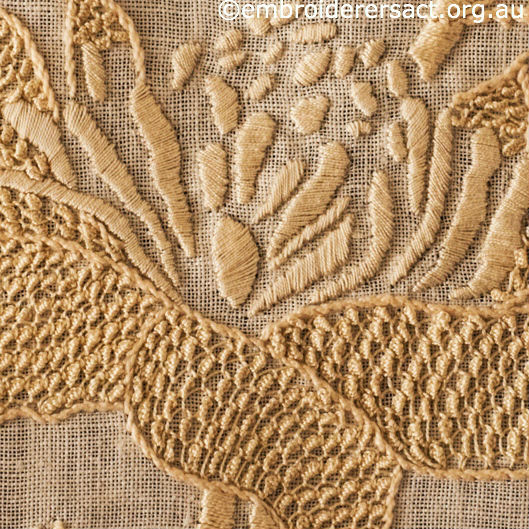 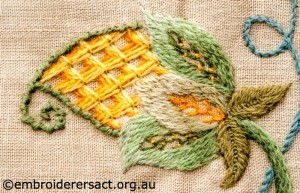 The caps of the acorns are needleace while the acorn themselves are embroidered in Satin Stitch. 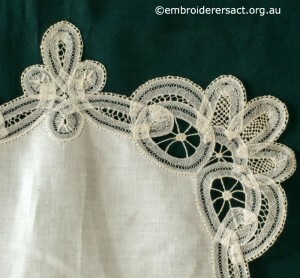 The blue hearts are also Satin Stitch. 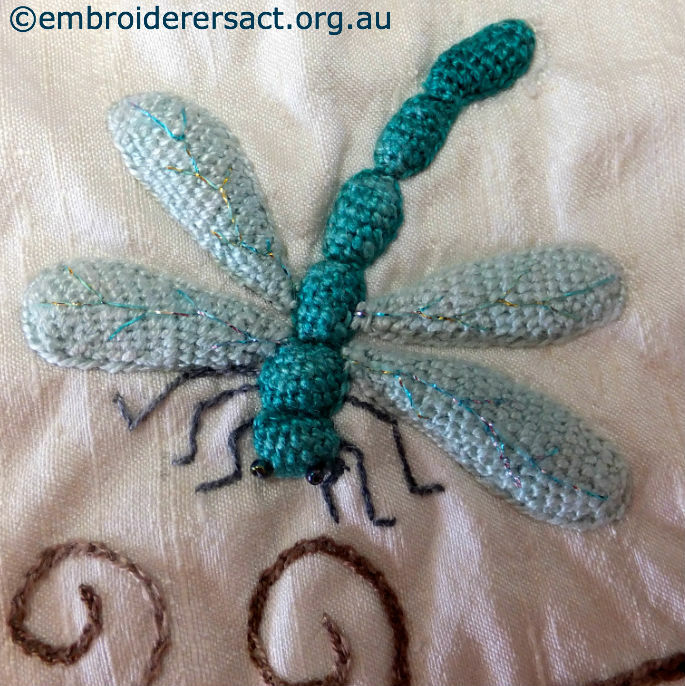 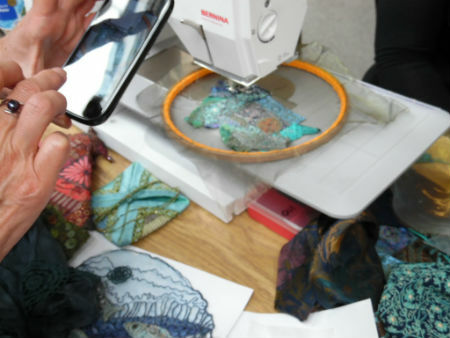 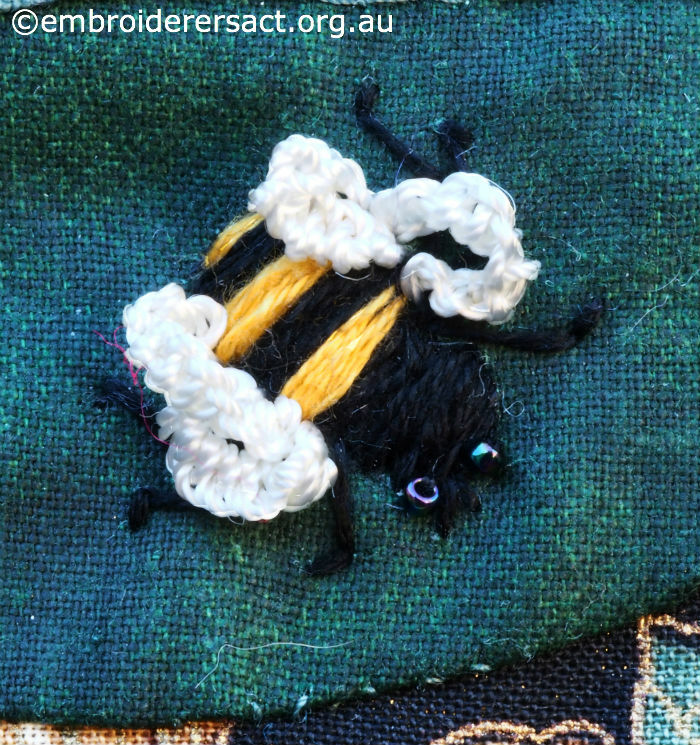 They are then finished with an outline in Holbein Stitch (also called Double Running Stitch). 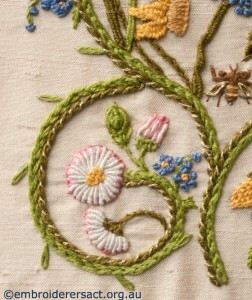 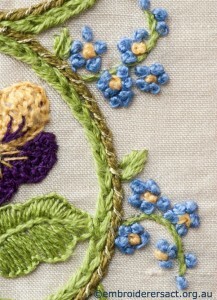 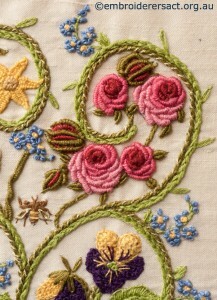 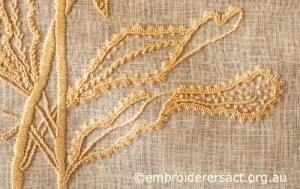 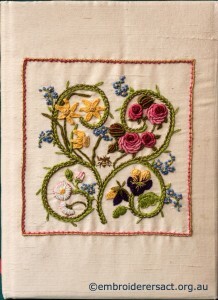 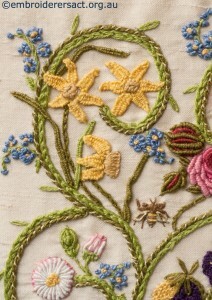 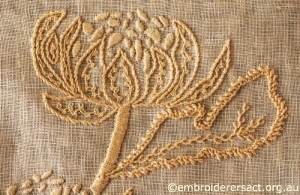 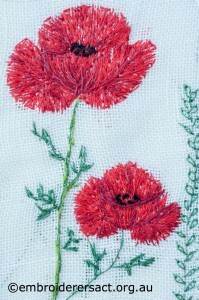 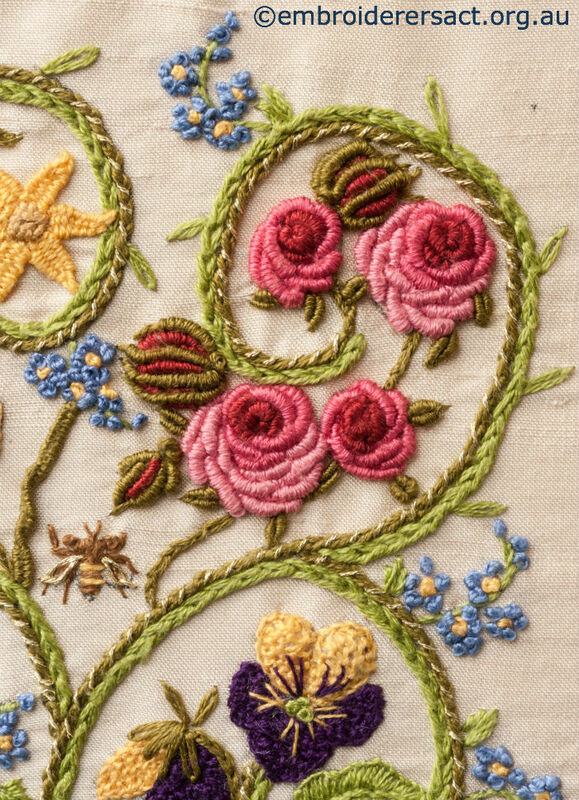 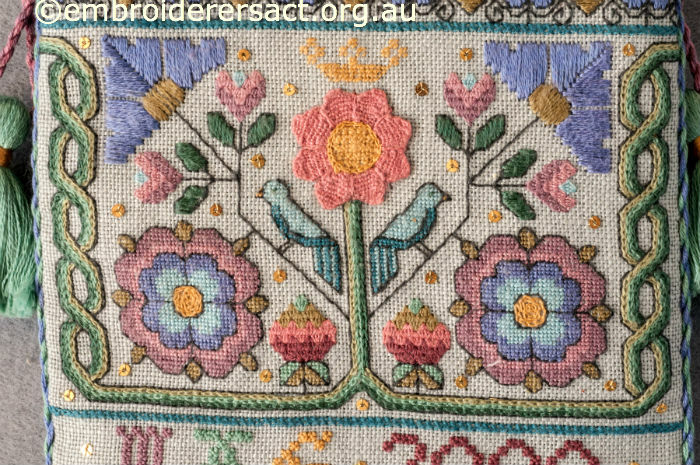 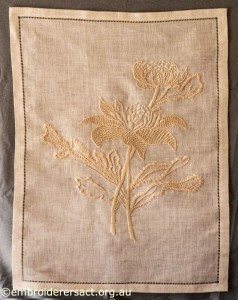 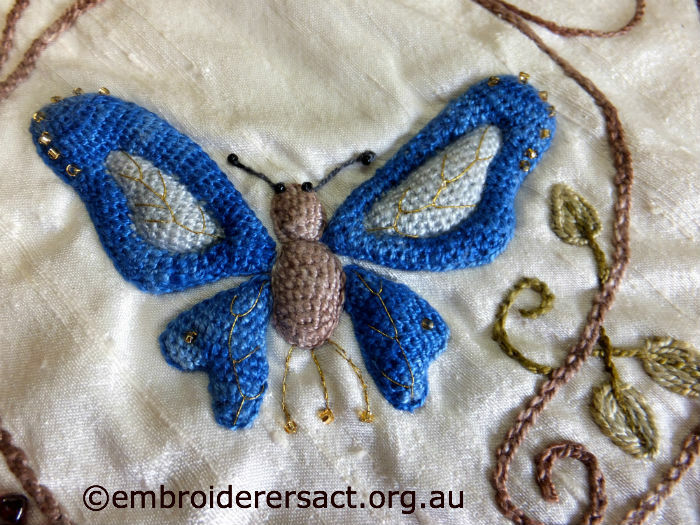 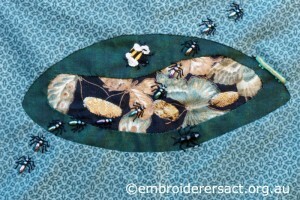 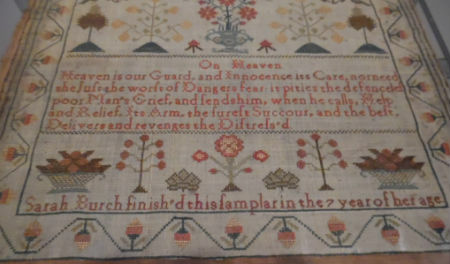 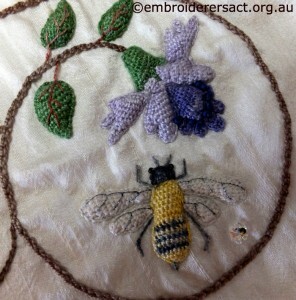 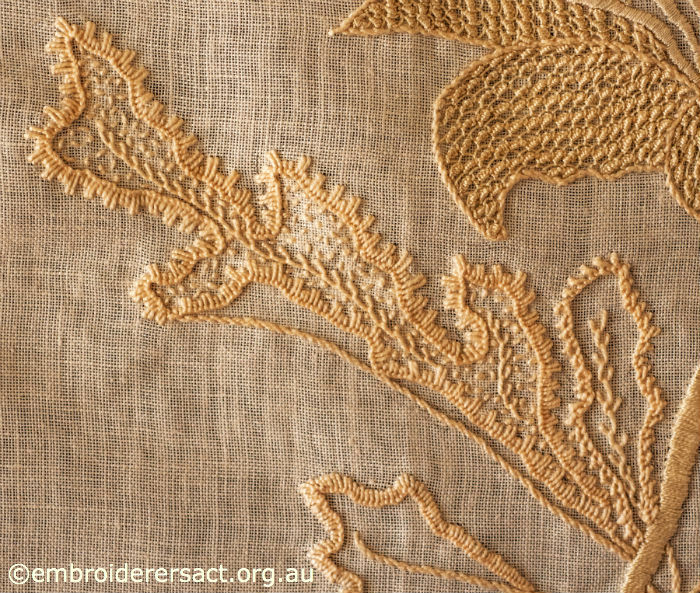 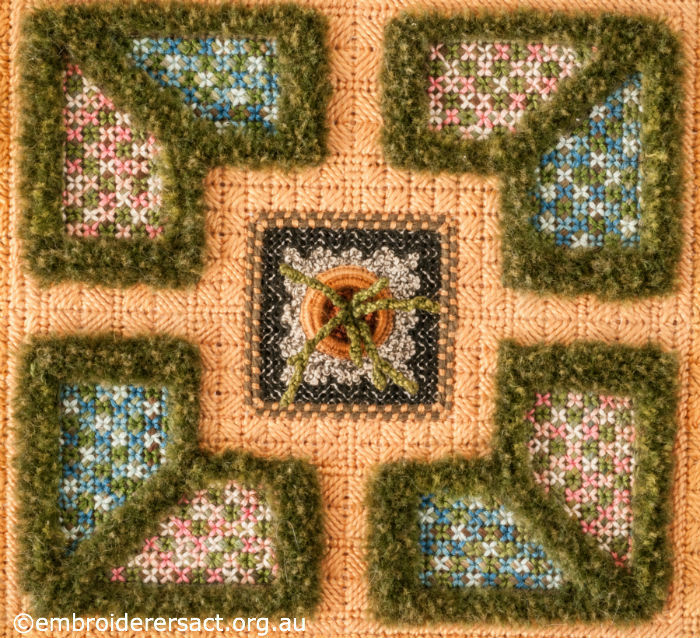 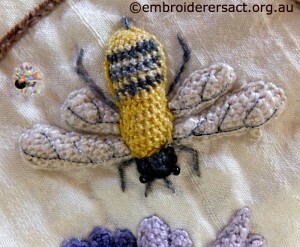 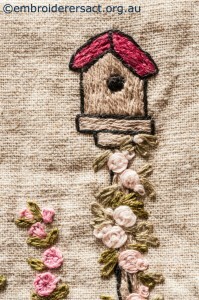 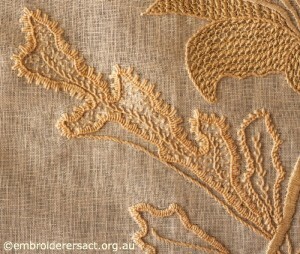 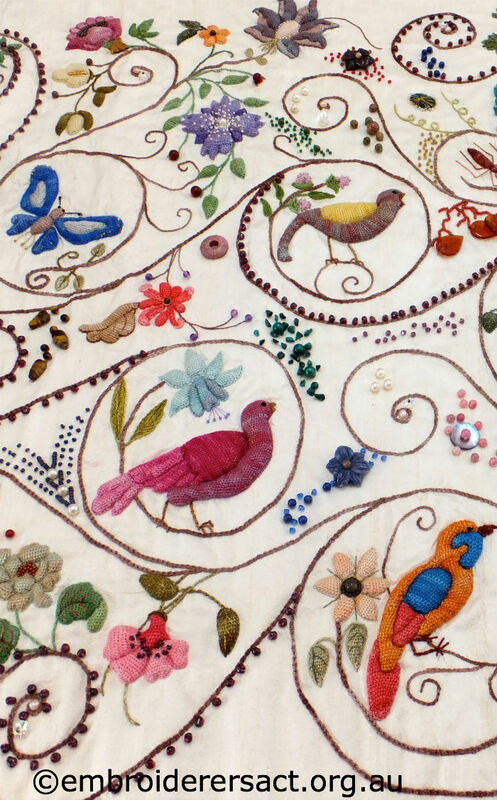 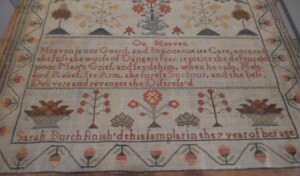 The centrepiece rose is again needlelace and the birds are filled in with Tent Stitch and outlined in Holbein Stitch. 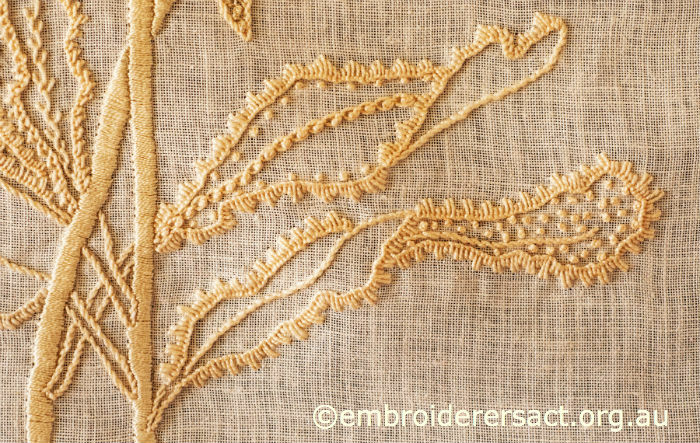 The use of Chain Stitch in three colours from dark to light is very effective in creating a geometric twisted vine effect to frame this central design. 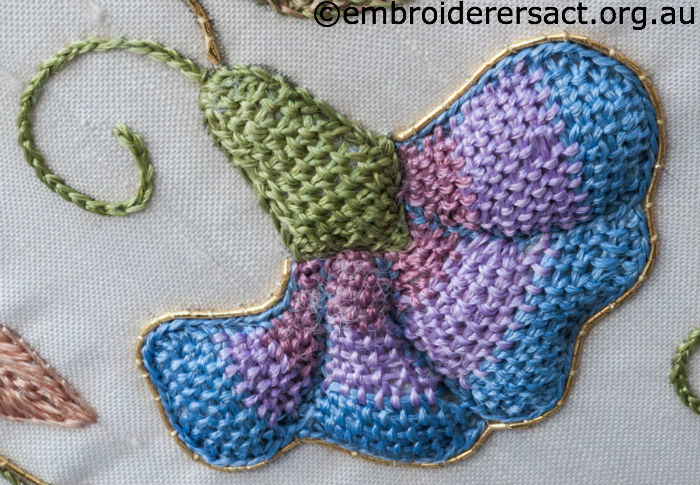 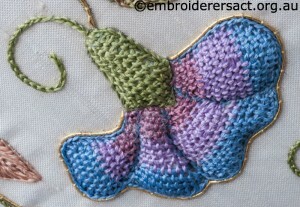 I’ve been practising this stitch and thinking of ways I can use it to create a lovely and very delicate surface. 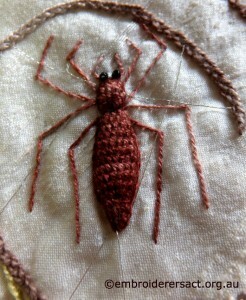 Look who we found in one of the cupboards! 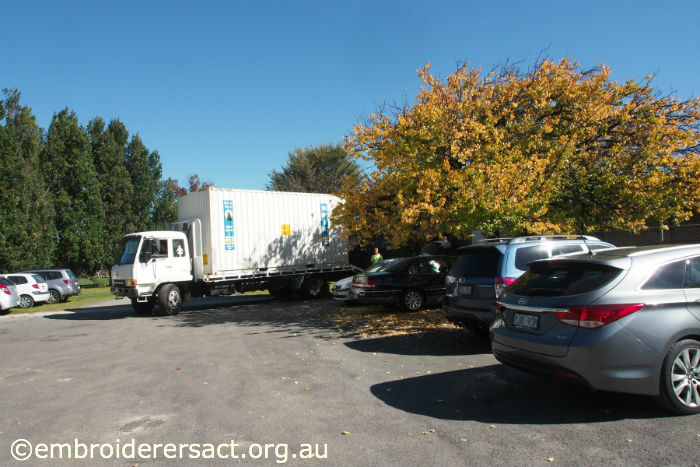 At the moment our new home at Hackett is just a sea of boxes, furniture etc and it’s going to take a huge effort to get everything sorted. So to help the settling in process go smoothly the morning and evening meetings that would have happened today have been cancelled – they start again next Monday 12 May. 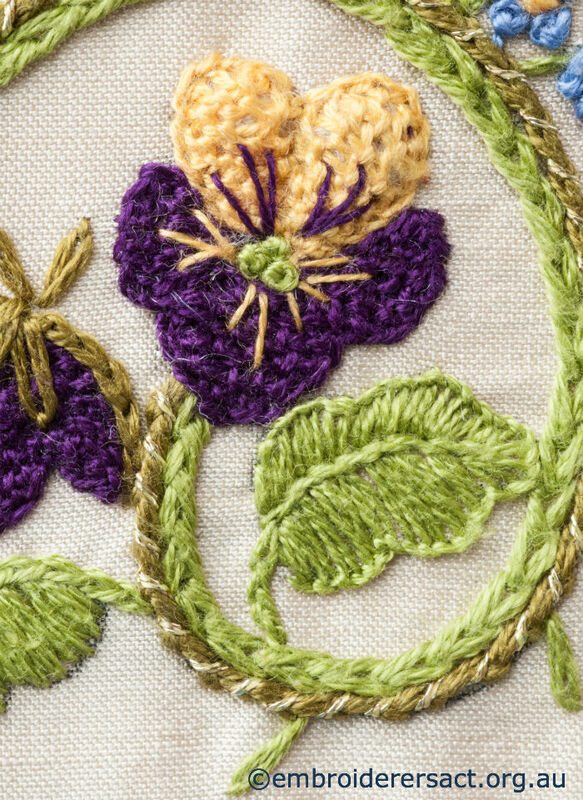 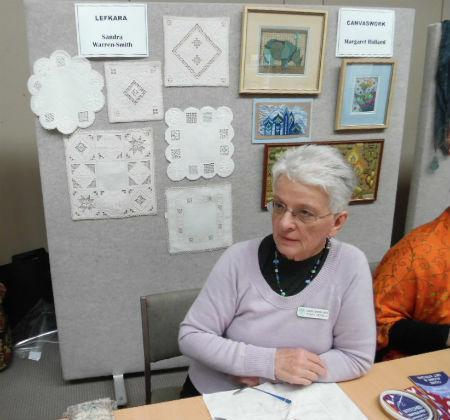 The May meetings for Hardanger, Creative and Paper Arts and Young Stitchers have also been cancelled – we’re really sorry about this and looking forward to things getting back to normal in June. This is another exquisite piece from Marjorie Gilby. She created the design for a class with Pamela Watts in a technique called ‘scribble canvas’ in 1998. 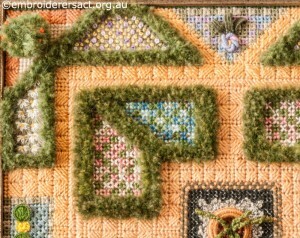 Just click on the photos if you want to look more closely. The green plant in the pot is done in needlelace. 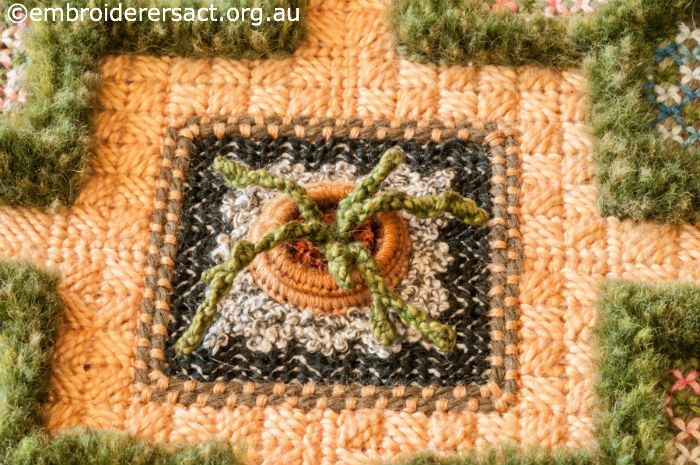 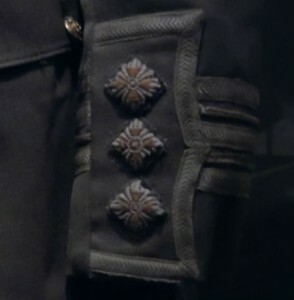 The pot is constructed of two metal rings each of which has been sewn over with Buttonhole stitch. 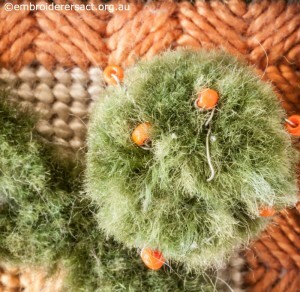 These two rings were then laid on top of each other and stitched together. 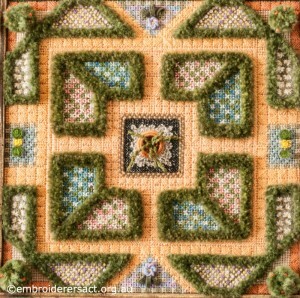 The grey/beige ‘pebbles’ around the pot are French knots while the terracotta pavement is Cushion Stitch. 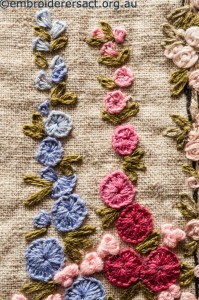 The flat blue and pink flowers are Rice Stitch. 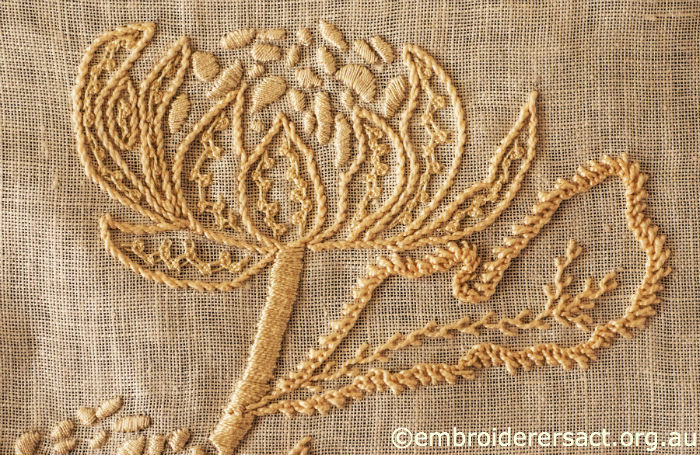 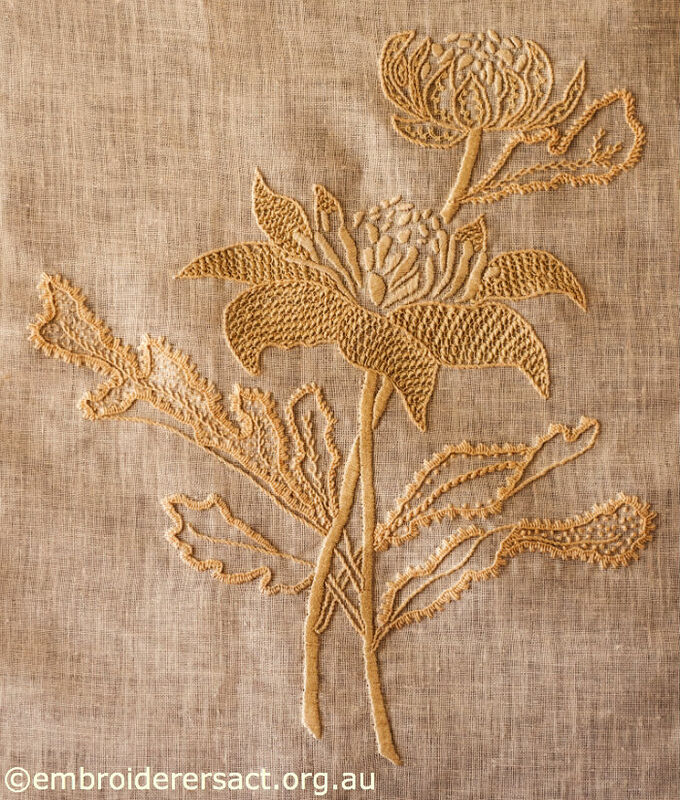 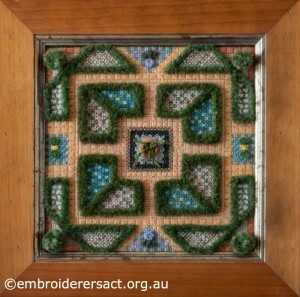 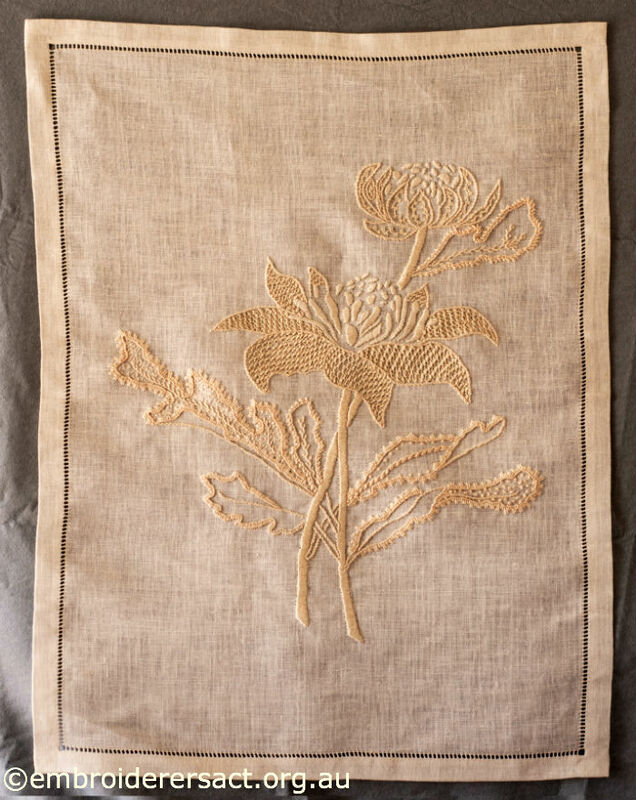 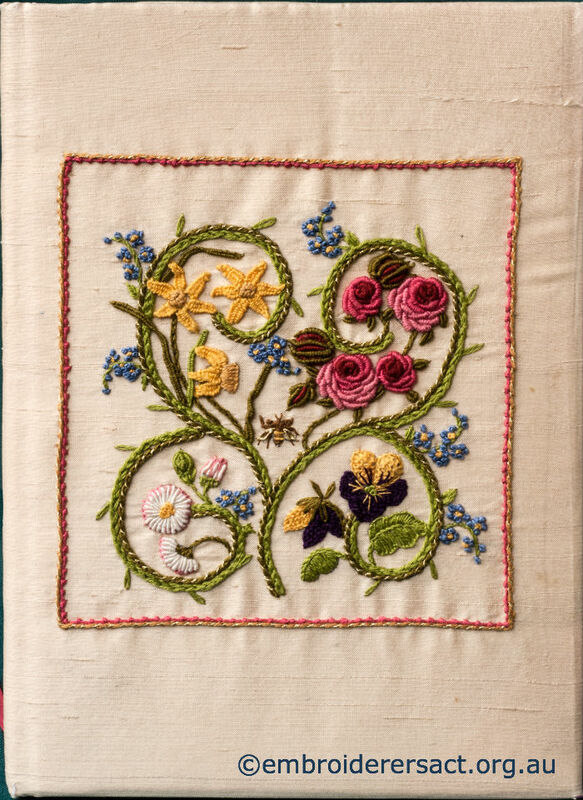 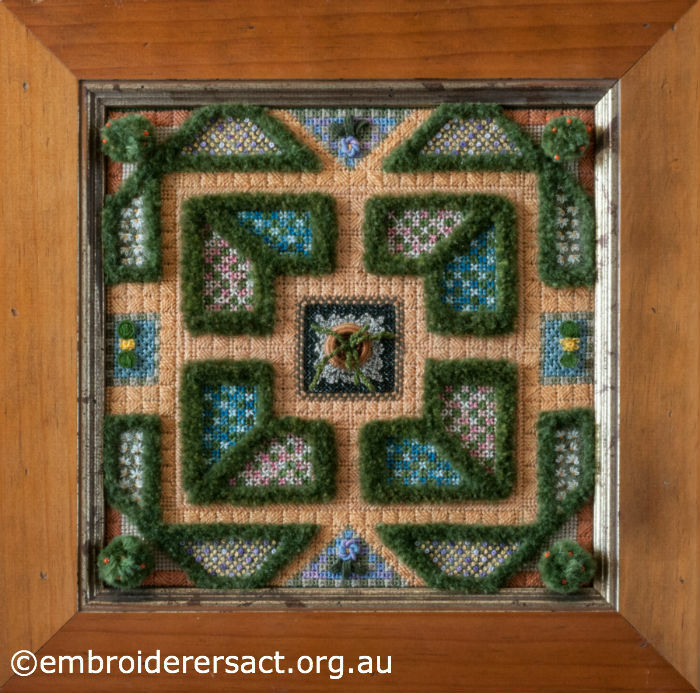 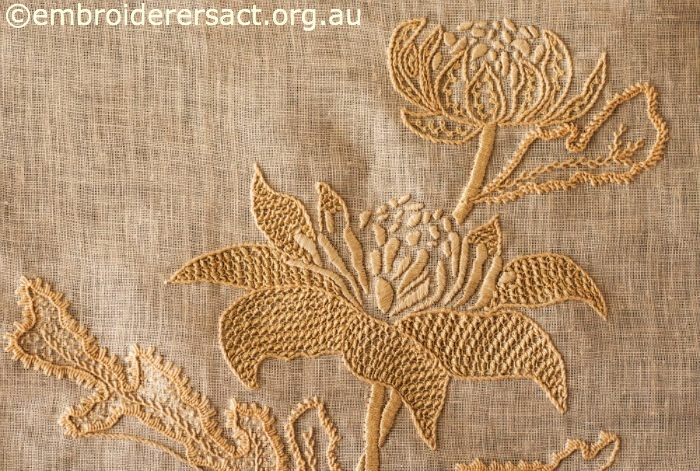 To create the waterlillies in the bottom left hand corner Marjorie first made needlelace leaves and then she used Cup Stitch to give dimensionality to the lily flowers. 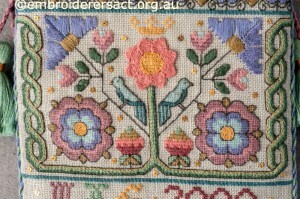 Now you might remember Velvet Stitch (also called Turkey Stitch or Ghiordes Knot) from the blog post about Audrey’s extraordinary Aran style Canvaswork pillow here. 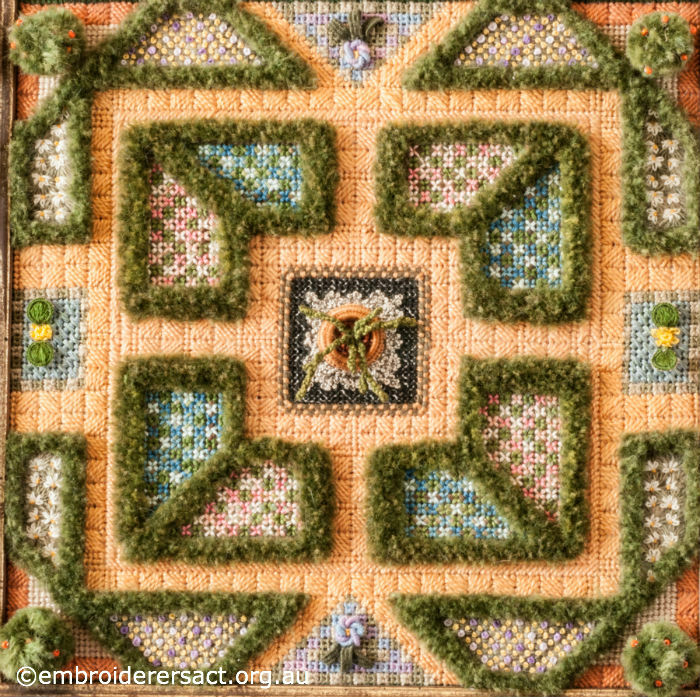 It’s used to create a plush pile and here Marjorie has stitched it in green wool to create a box hedge for the parterre. 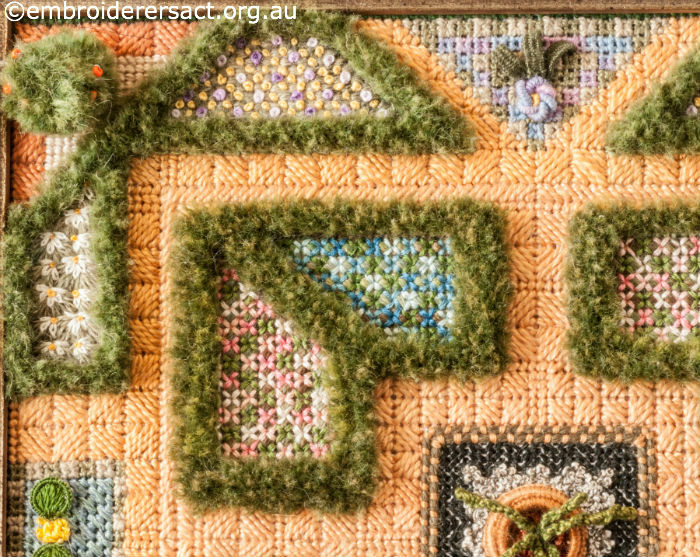 Here’s a tip that Pamela Watts passed on to Marjorie for creating a thick and even pile – use an eyebrow brush to shape and fluff up the pile after you’ve cut off the top of the loops. 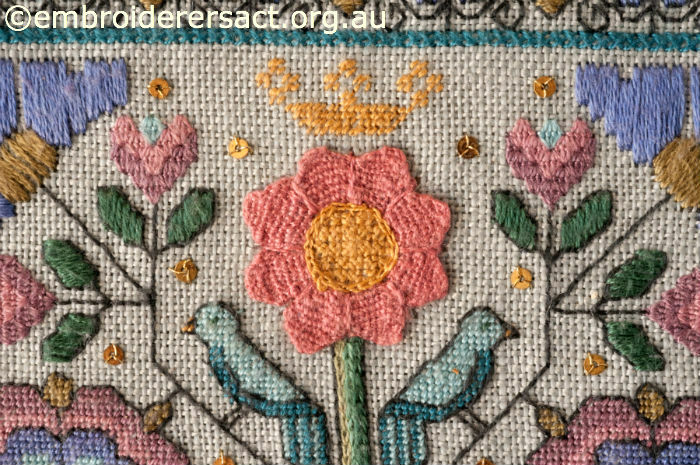 The other feature flower that’s repeated in the geometric design of this piece is made with Bullions and then set off with needlelace leaves. 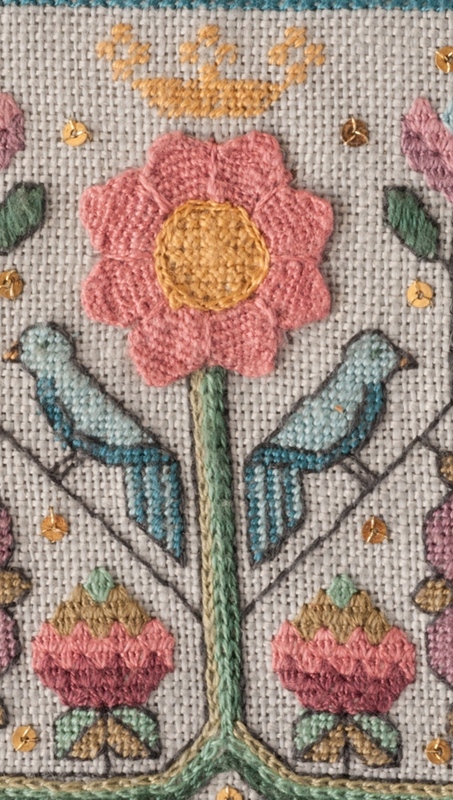 The surrounding triangle in mauves and pinks is done in Algerian eyelets. 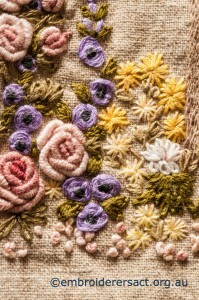 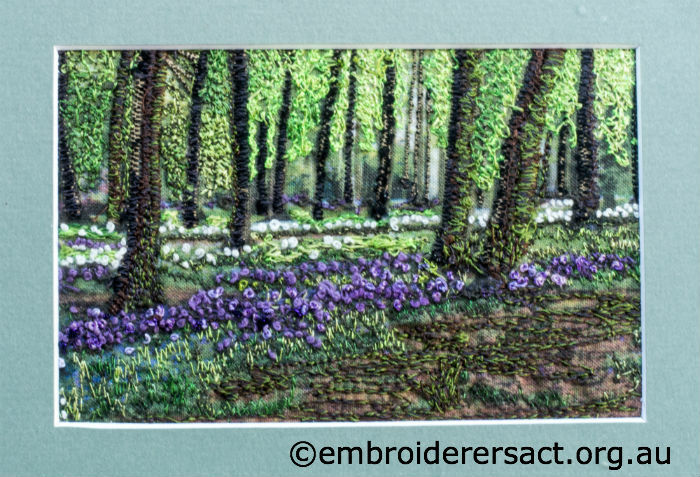 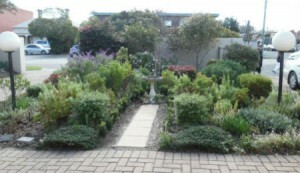 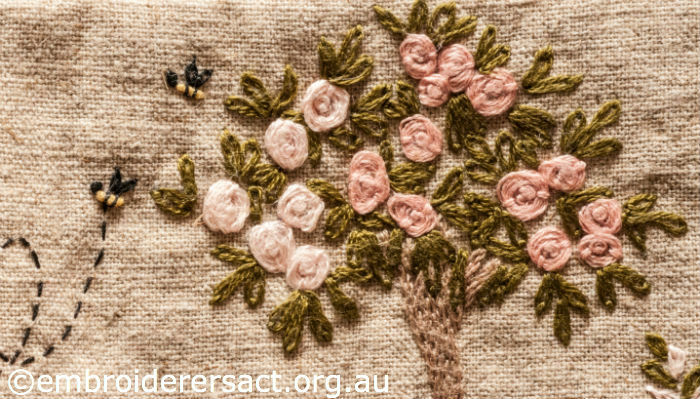 The small mauve and yellow ground cover flowers within the box hedges are French Knots. To create the shaped Cumquat trees Marjorie first made pompoms and then clipped them into a ball shape and added beads for fruit. 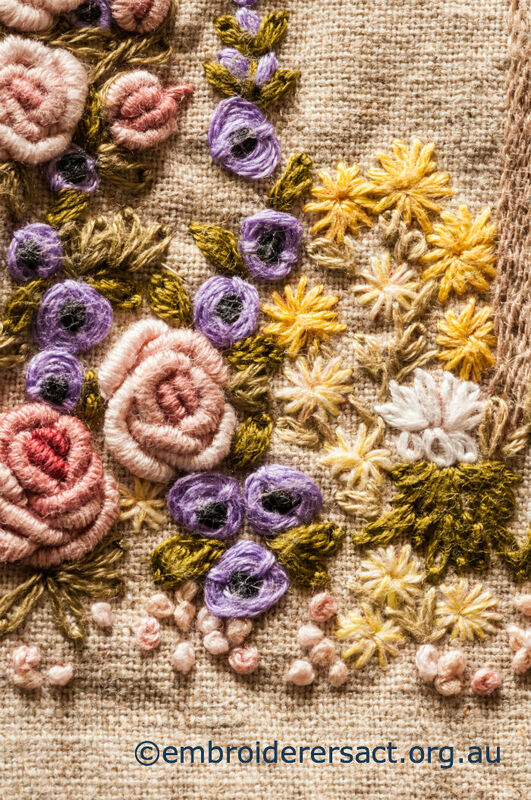 The texture, geometry and dimensionality created by all these different stitches is just awesome. 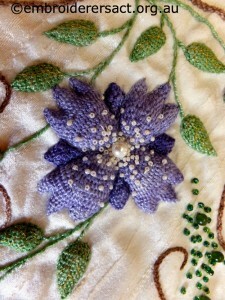 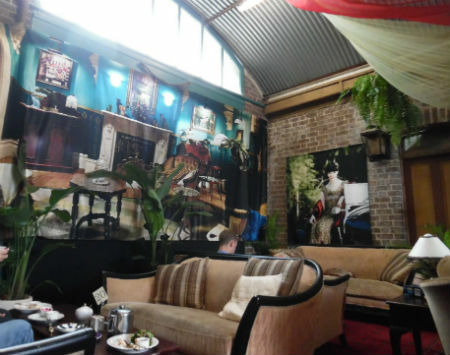 My favourite feature is the terracotta pot and plant in the centre of the piece. Do you have a favourite feature? 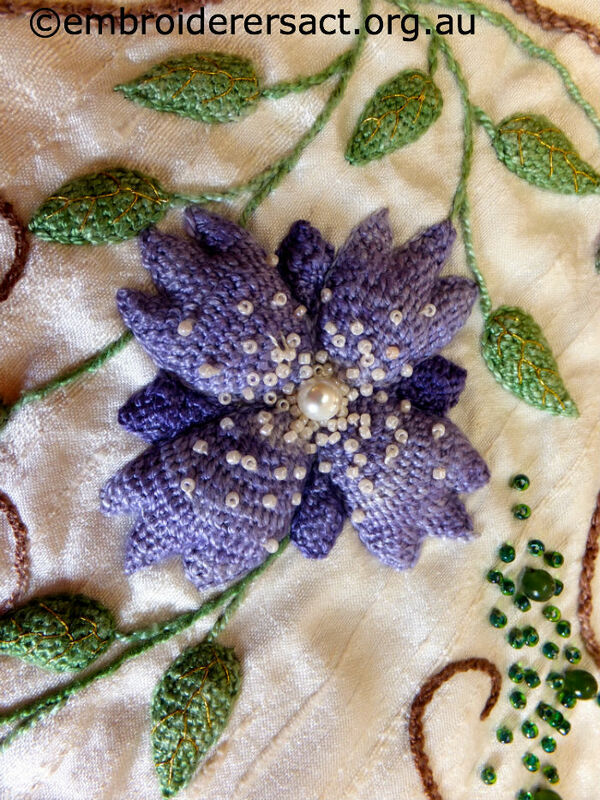 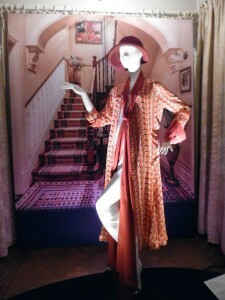 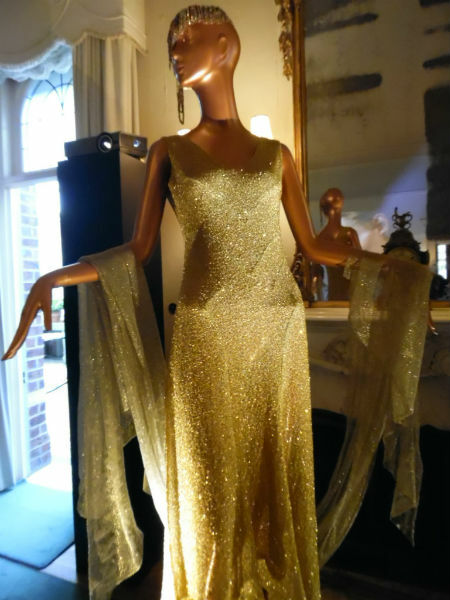 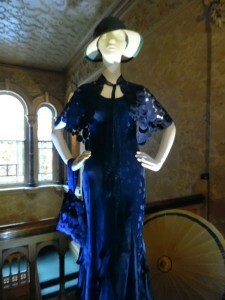 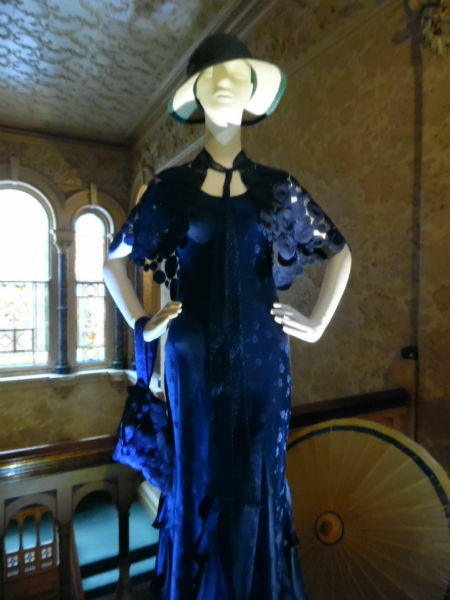 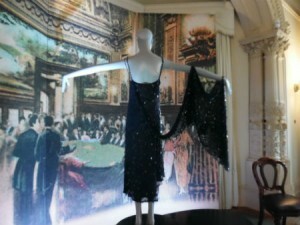 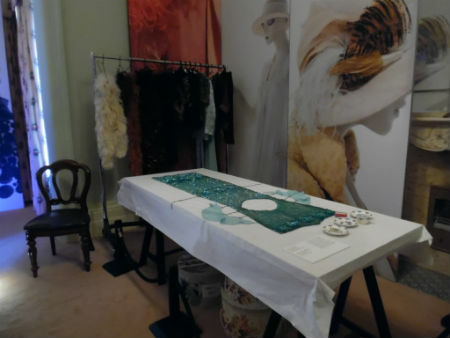 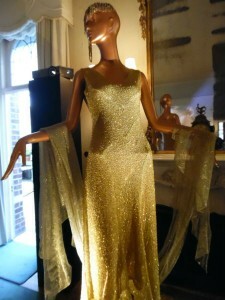 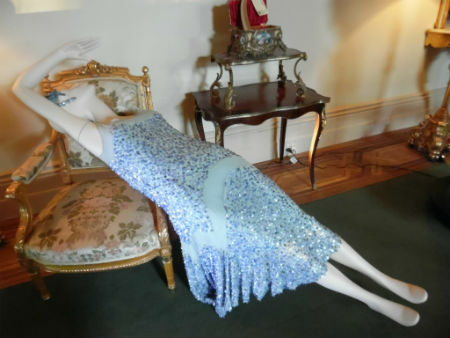 Marjorie – a heartfelt thanks again for sharing your wonderful pieces with us. 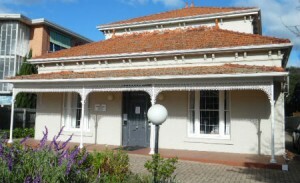 I’m still recovering from the big Italian festa we had at our place today. 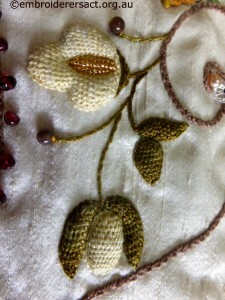 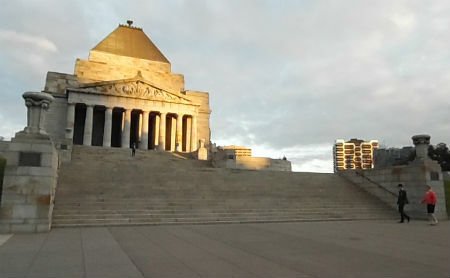 So for a complete change of pace I’ve decided to update the blog. 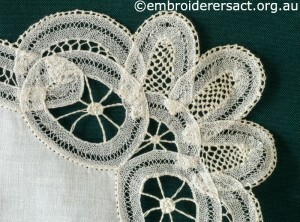 On the same day that Audrey brought in her wonderful cushions Margaret Thompson, another longstanding member of the Guild, showed me two pieces of Tape Lace she’d made. 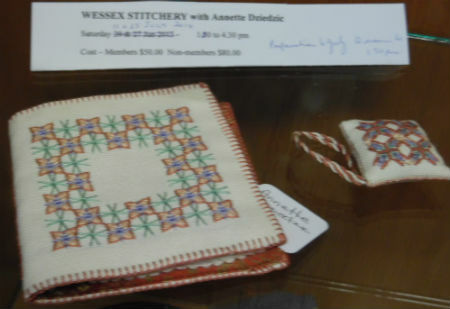 Like Audrey with her cushions Margaret was very doubtful that anyone would be interested in these pieces………..I assured her they were treasures and lots of people would be interested. 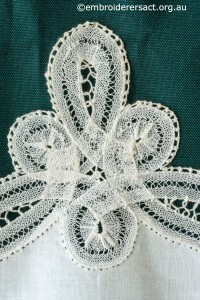 Tape Lace is also known as Tape Guipere. 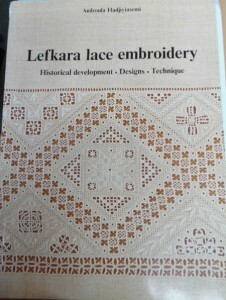 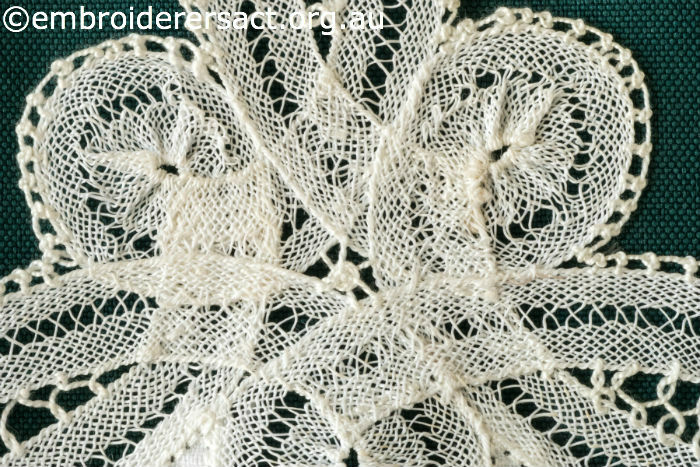 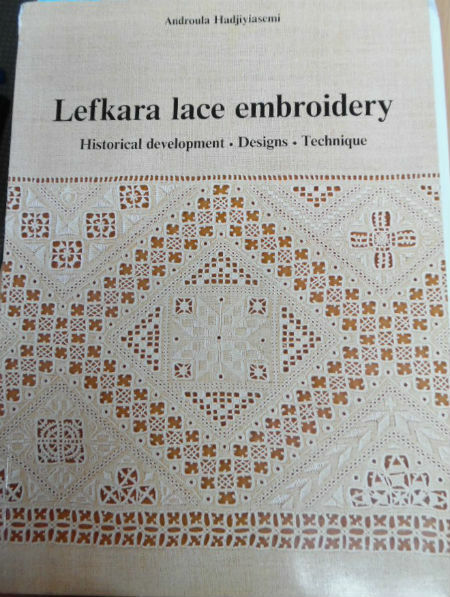 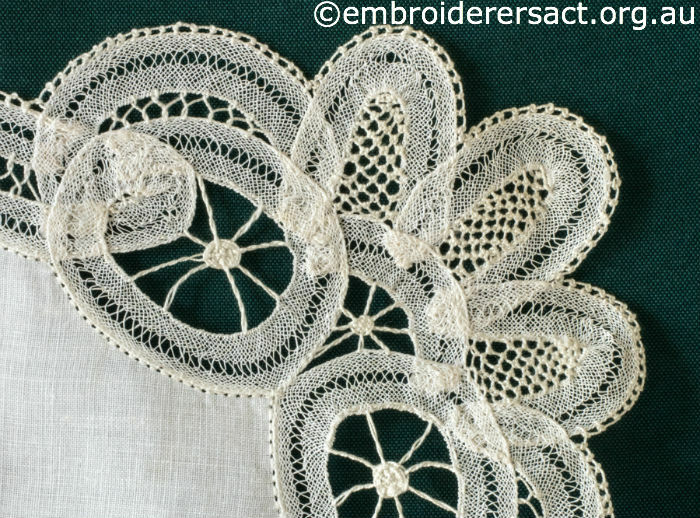 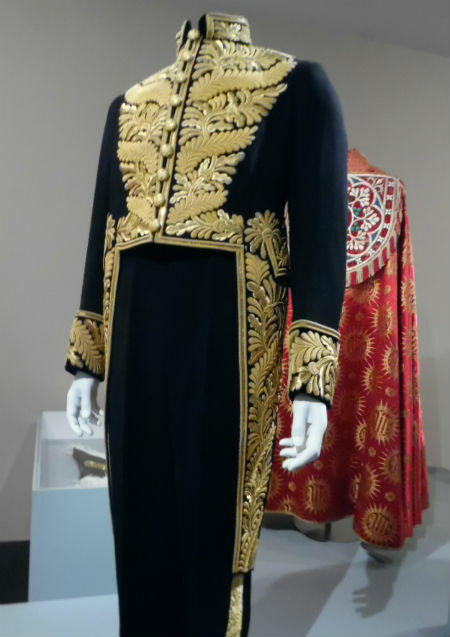 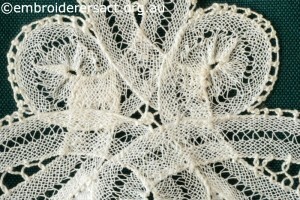 It’s a type of needlelace where the tape is used to outline a pattern or motif and provides the foundation for the needlelace bars and stitches. 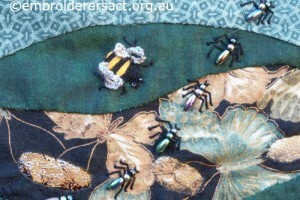 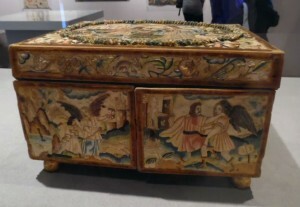 There are 17th century examples from Genoa in Italy where the tape is hand made using bobbins. This allows the tape to sit flat and curve continuously. 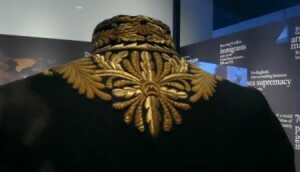 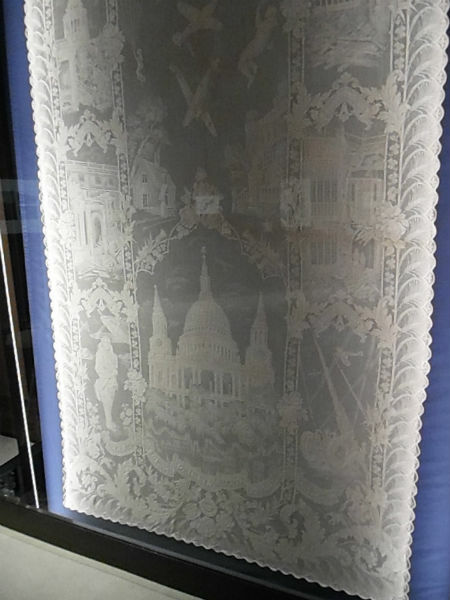 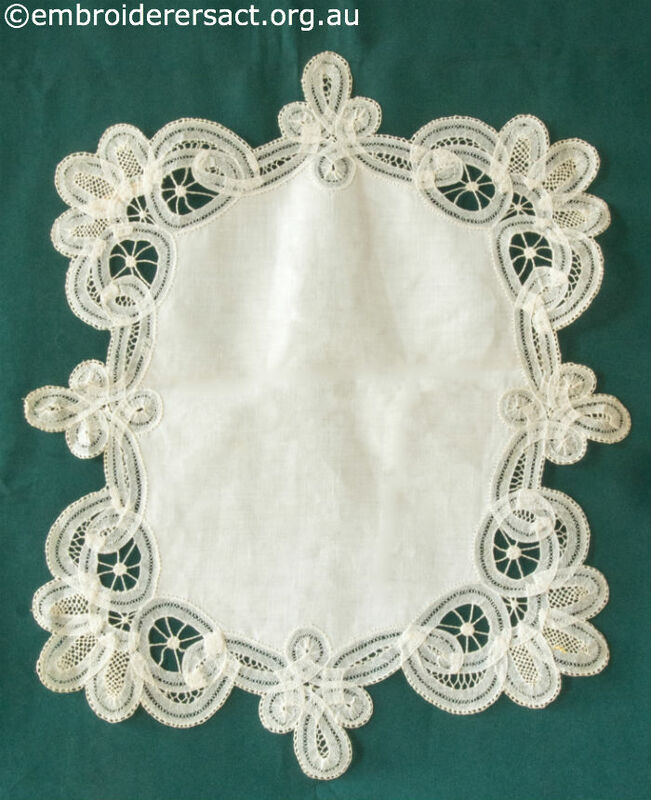 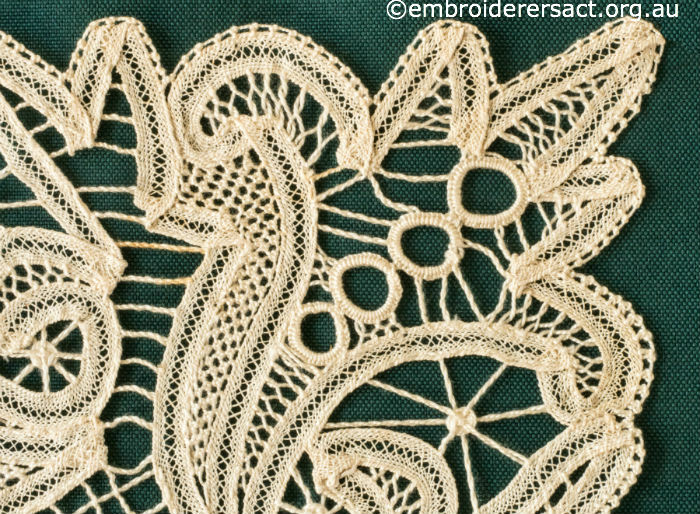 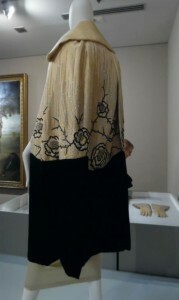 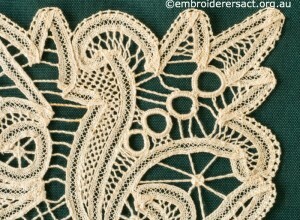 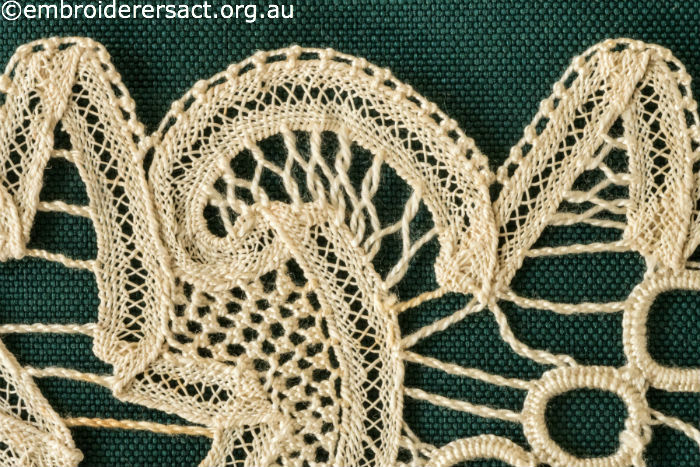 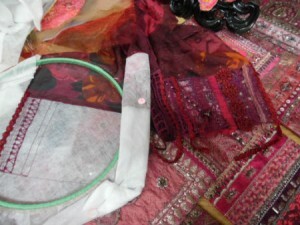 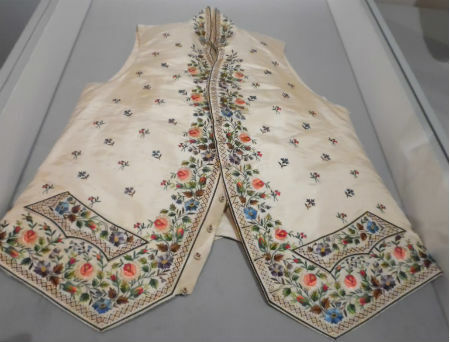 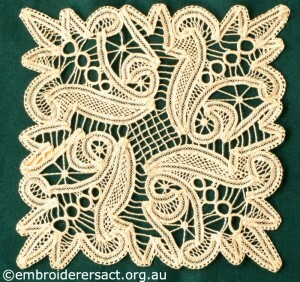 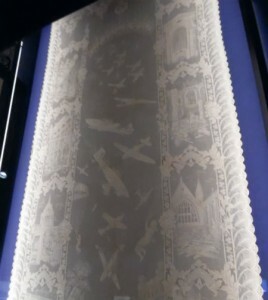 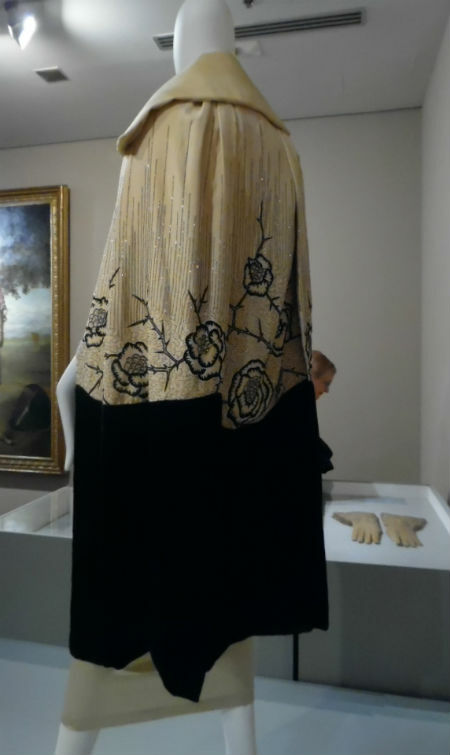 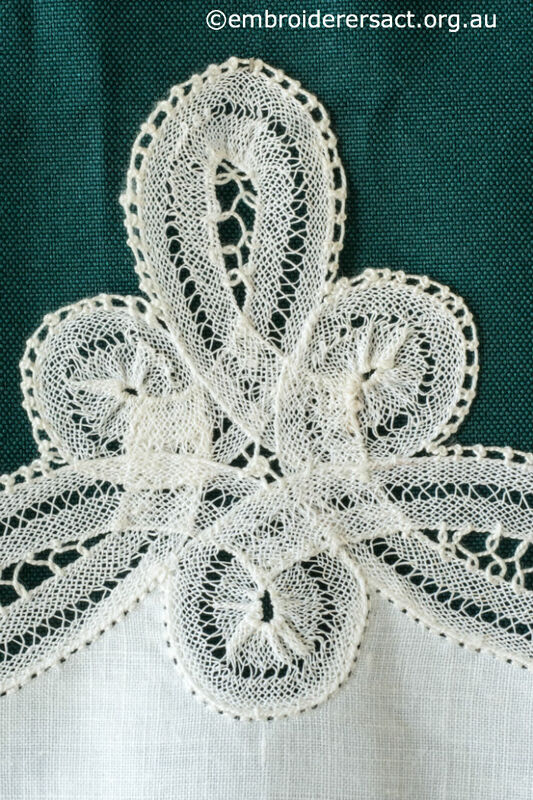 Most of the Genoese Tape Lace pieces were imitations of Venetian Lace. 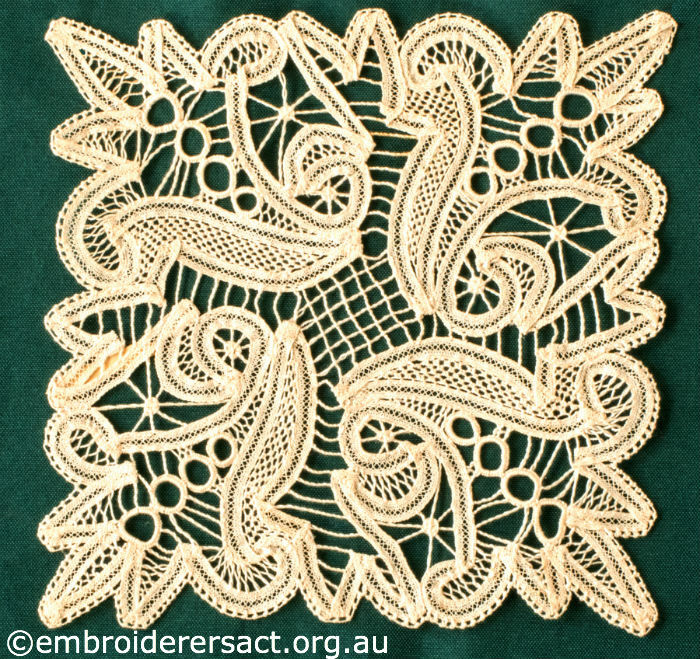 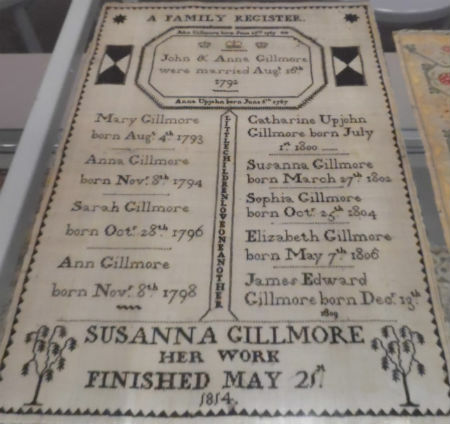 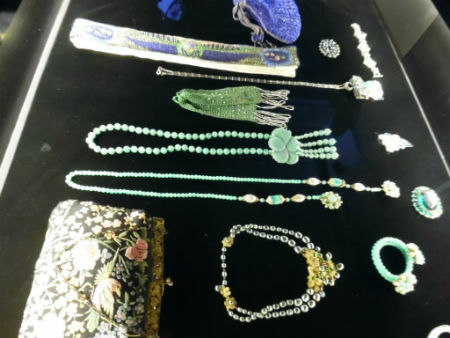 There was a revival of this style of lacemaking in the 19th century in the UK and Ireland – you can read more about it here. 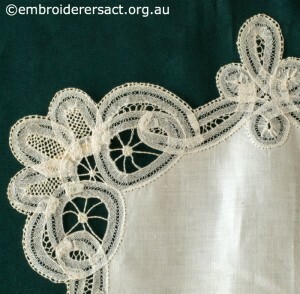 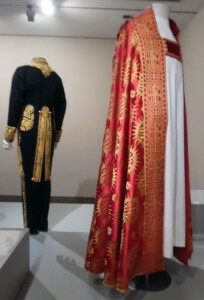 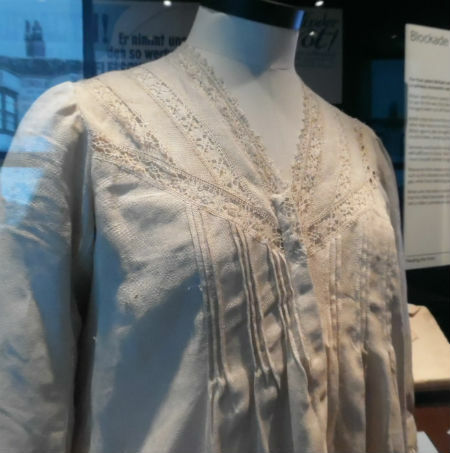 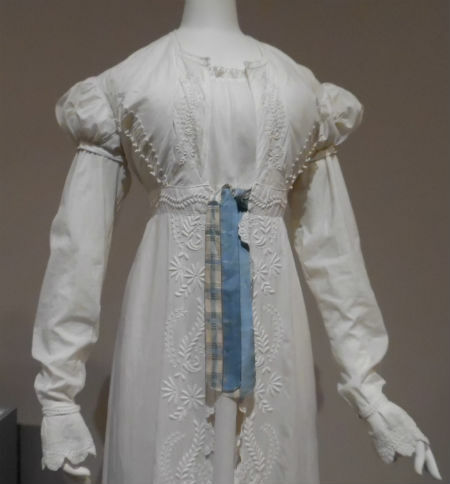 The big difference between these and the earlier examples of tape lace is that the tape was machine rather than hand made. Margaret’s two pieces are exquisite and we can see this in all its detail thanks to Stewart Bath’s wonderful photographs. If you’ve ever done any Tape Lace we’d love to hear your comments about this technique. 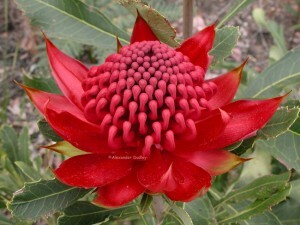 Margaret – your work is just beautiful and I was blown away by its delicacy – thank you so much for sharing it with us.